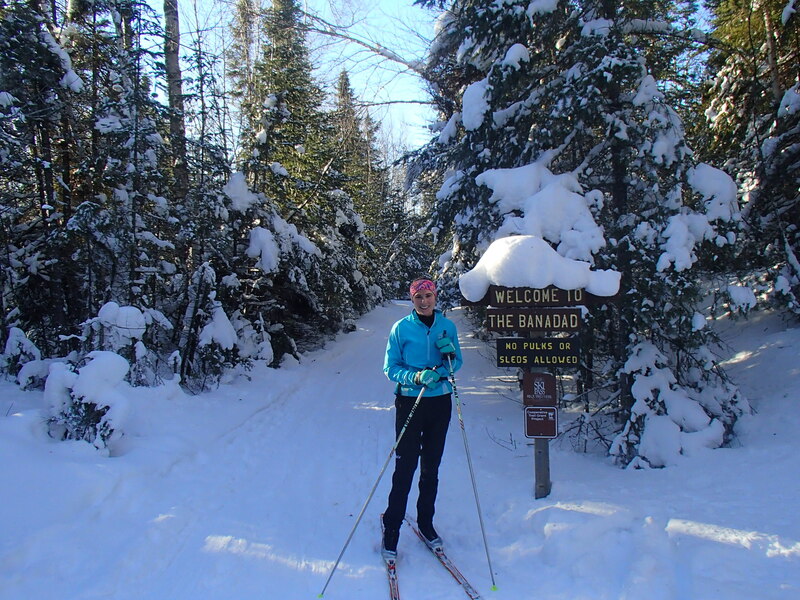 Archive by category "New Blog"
This year Kate and I finally skied the full length of the Banadad Ski Trail. 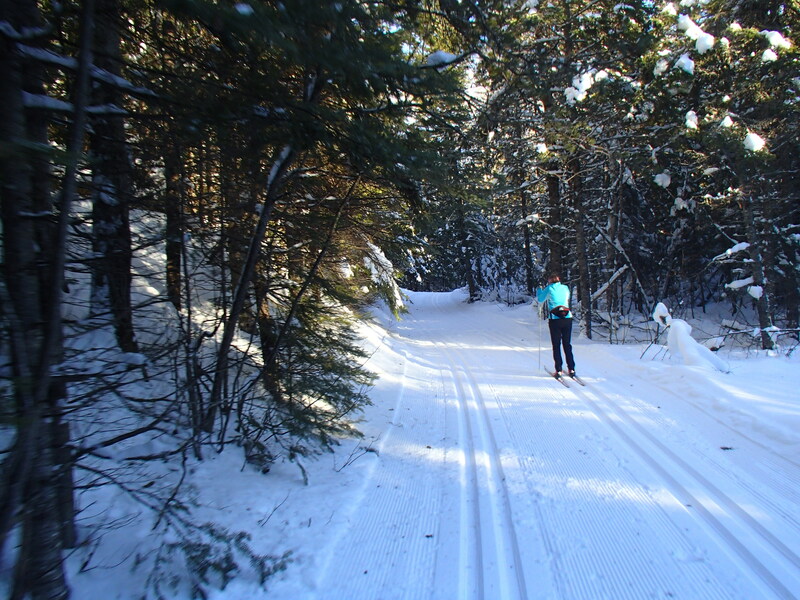 It’s been something we’ve been meaning to do for a long time, and has remained a stain on our resume of Gunflint Trail skiers. 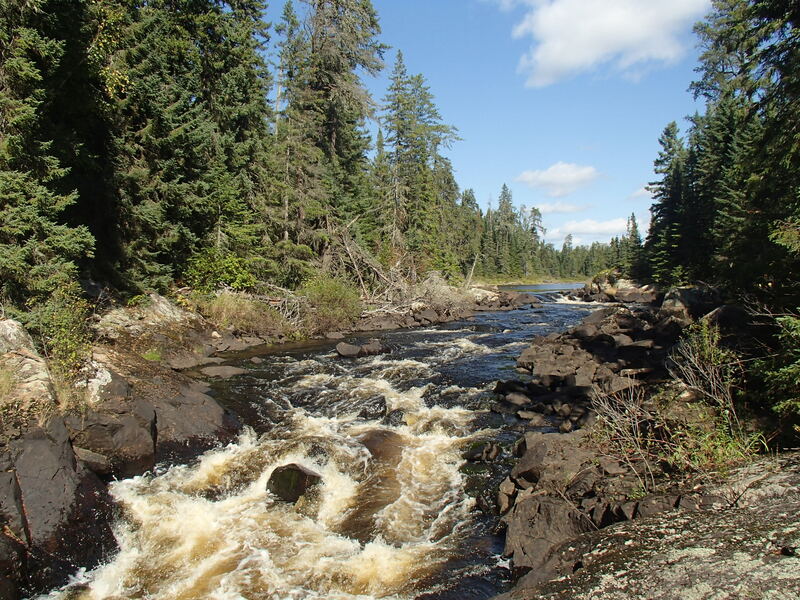 The Banadad trail is a 27 km trail traveling through the BWCA. 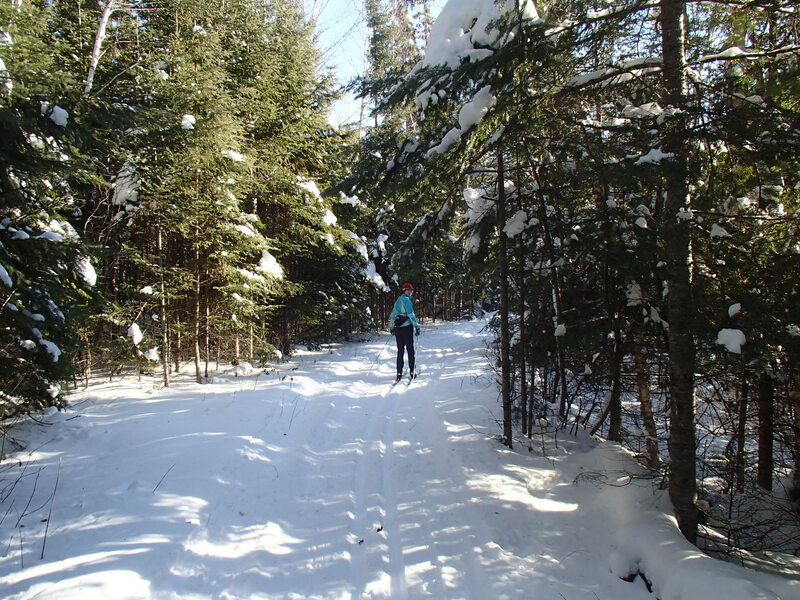 Unlike Bearskin’s ski trails it is a narrow single track trail, so classic skiing is the only option. 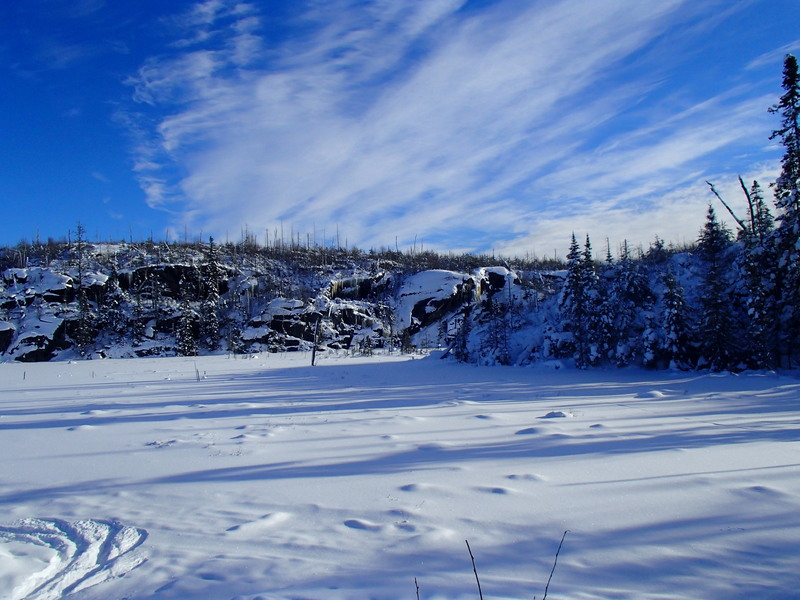 The eastern end of the trail connects to the Lace Lake trail, a short 4k loop that then ties into Bearskin’s Poplar Creek trail, allowing us to start at the west end and ski home. 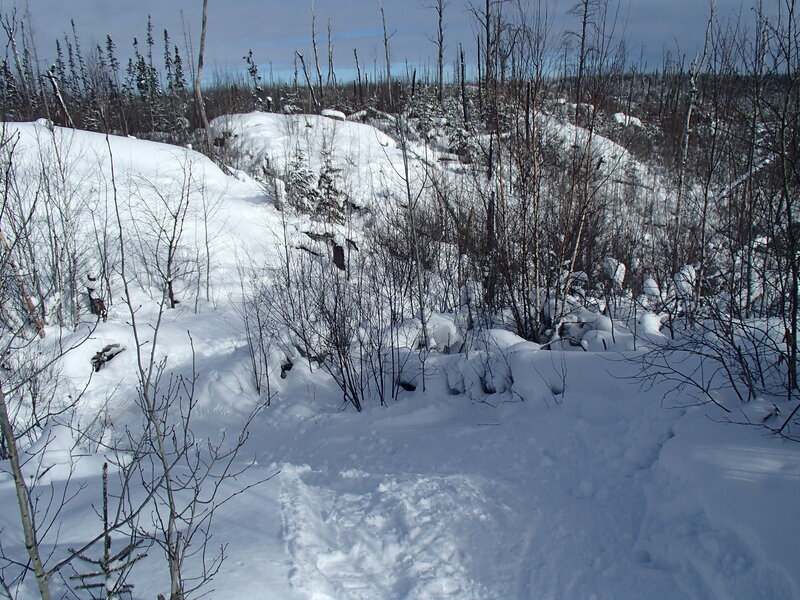 Most of the trail is fairly flat, with a few exciting hills in the middle section. The grooming was in great shape, and the weather was perfect. Just past the half way point we stopped for a quick snack in a sunny opening at the bottom of one of the larger hills. 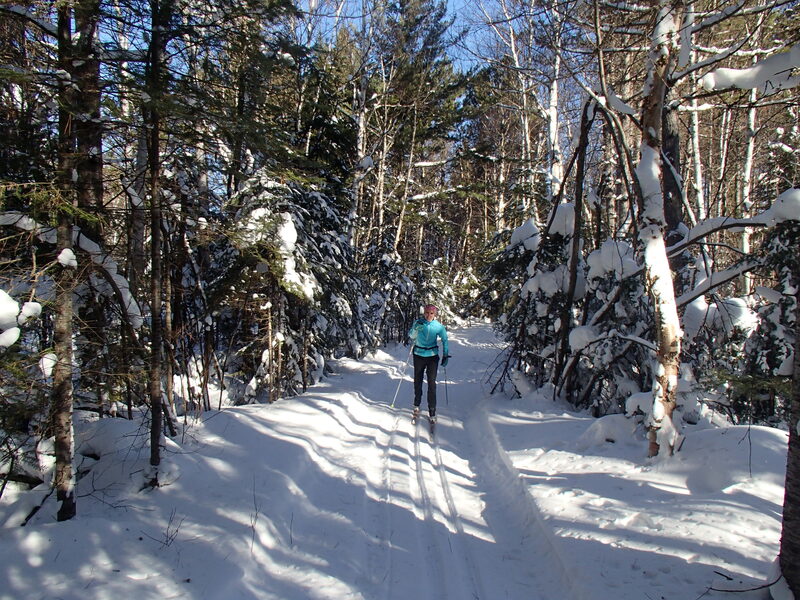 It was evident from the tracks of other skiers that most of the traffic on the trail was starting at the east side. 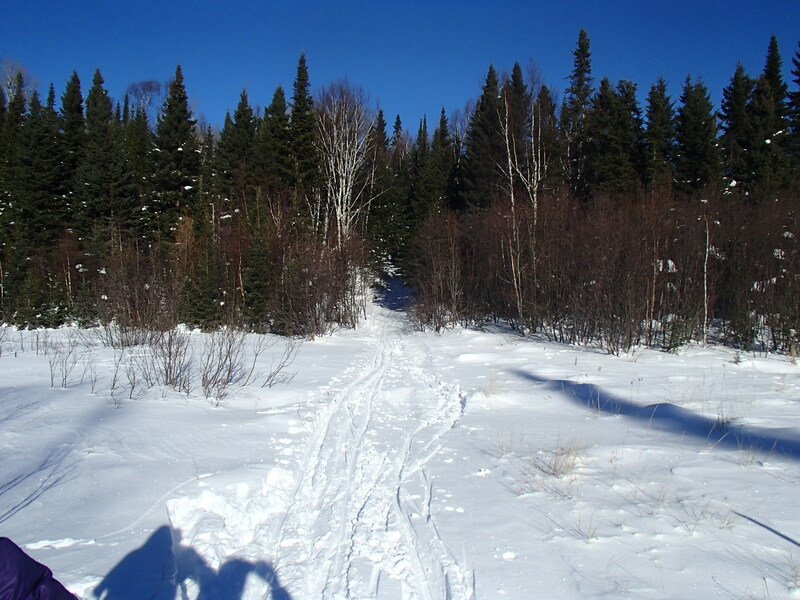 A short while after our snack break we entered a clearing and saw a moose staring back at us in the middle of the ski trail. We watched each other for a good while. It became apparent that the moose had no interest in moving. Turning around was not an option for us, so we tried politely reasoning with moose and scooted forward a bit. When we got closer 3 more moose revealed themselves, and we realized that we were simply going to have to wait. 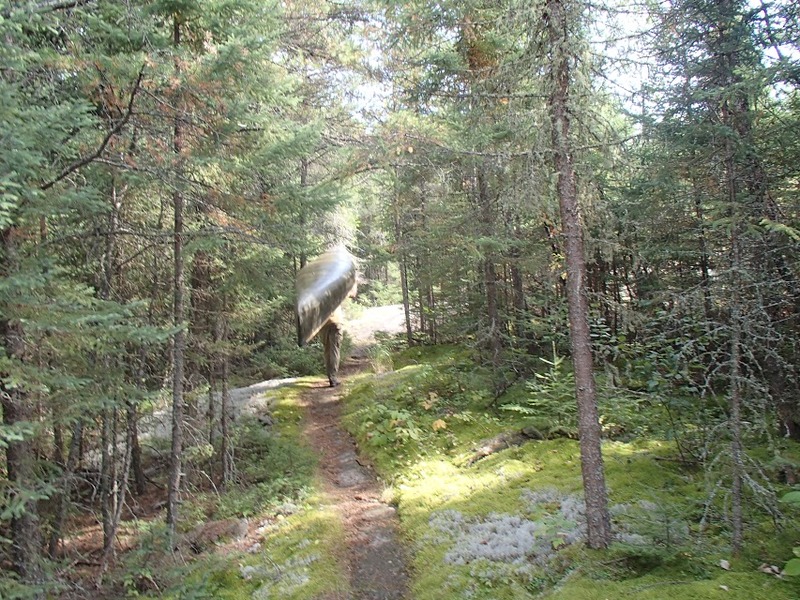 After a short wait the congregated moose decided that they had no more business to conduct on that section of trail, and headed on their way. We finished the trail, and took photos at the trail head. We hadn’t thought to do the same at the western trail head, so you’ll just have to believe us that we started there. 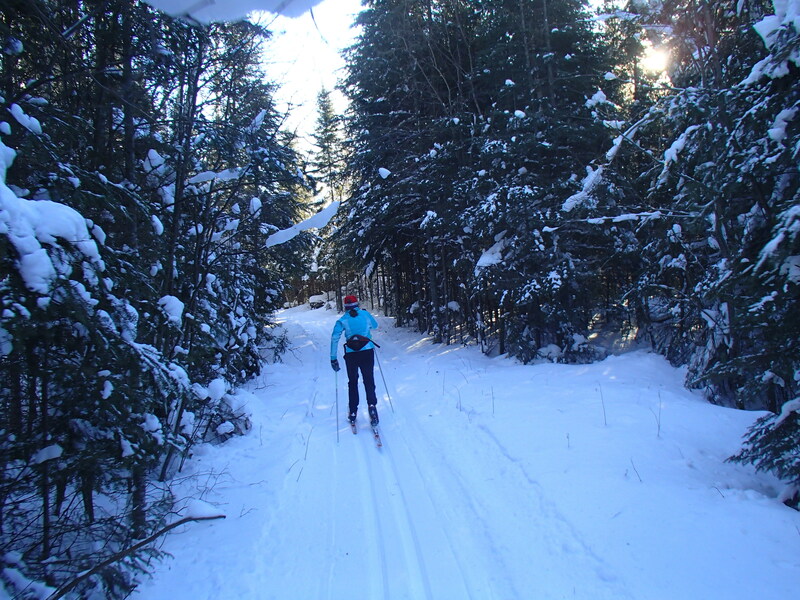 We skied the Lace Lake trail, and were reinvigorated once we hit Poplar Creek, one of our home trails. We made the harrowing descent of the gravel pit hill and were home. 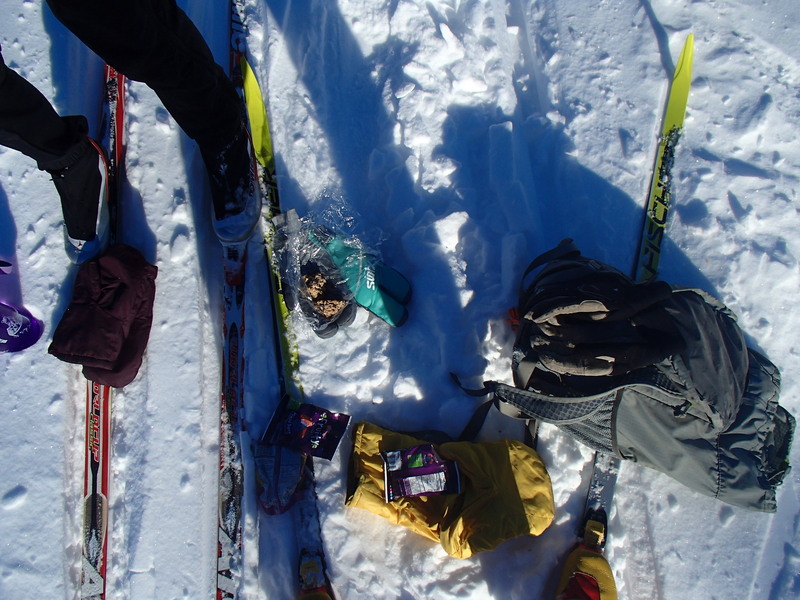 It was a long day of skiing, and it felt good to be finished. 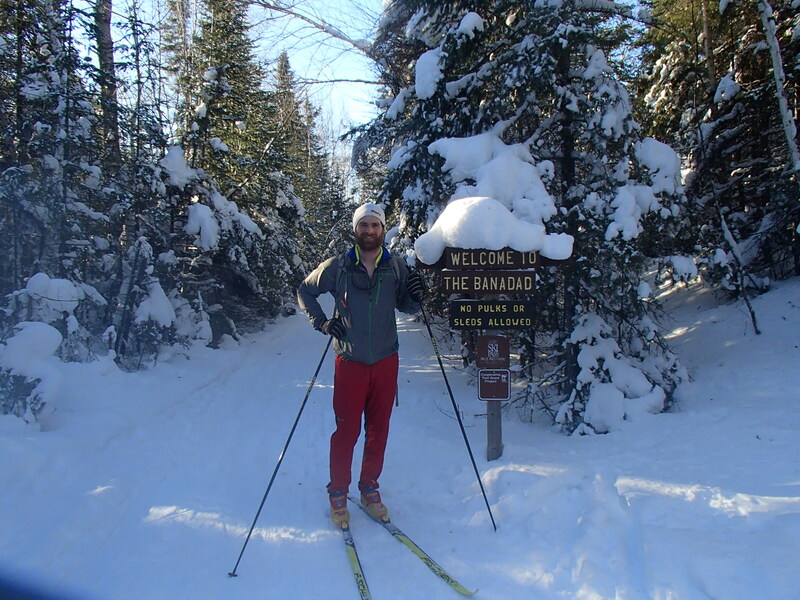 The Banadad is certainly one of the most unique ski experiences in the Midwest, and a great adventure. 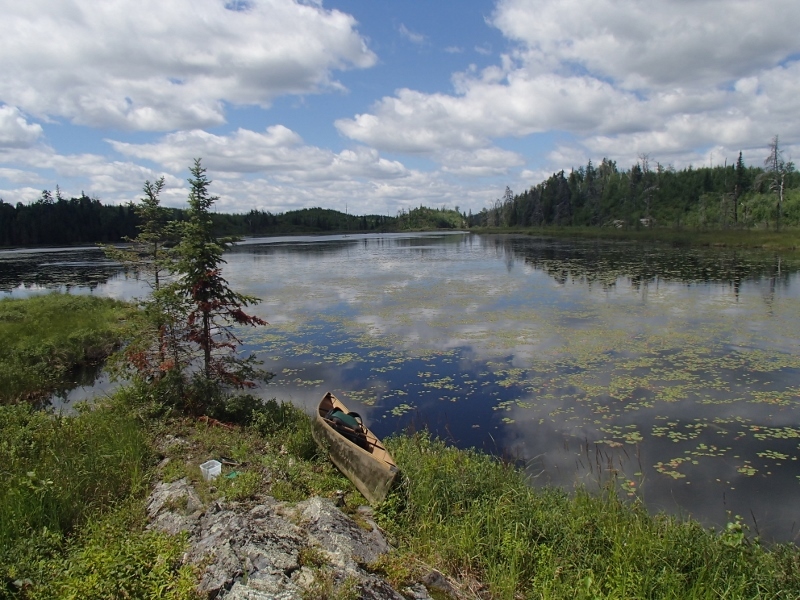 This year our annual trip to the Canadian Wilderness took us back to Nakina Ontario. 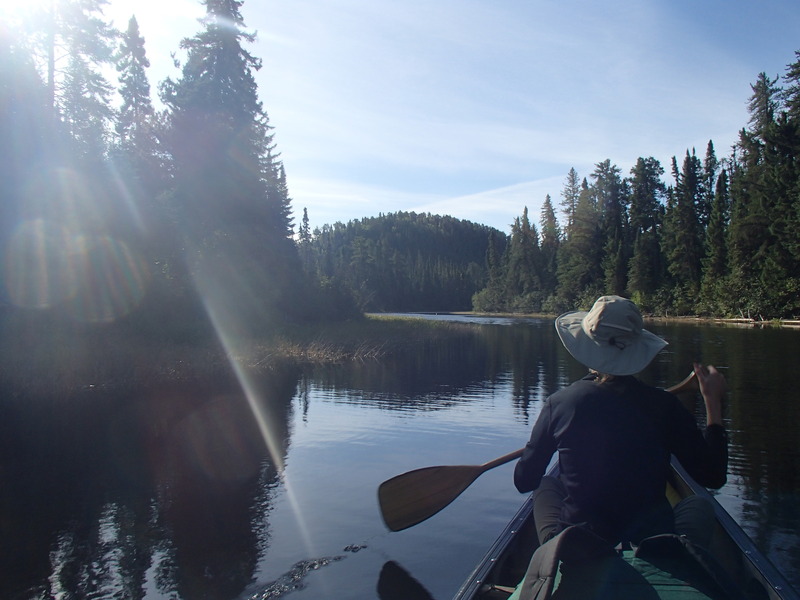 Nakina is a paddling (and fishing) paradise with many wilderness route options ranging from whitewater rivers to huge scenic lakes. 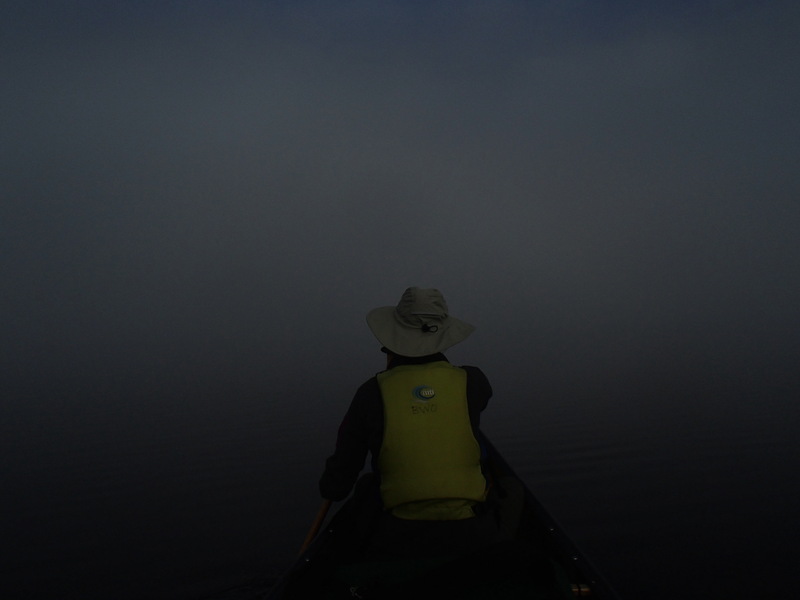 Despite this, it is rarely paddled. 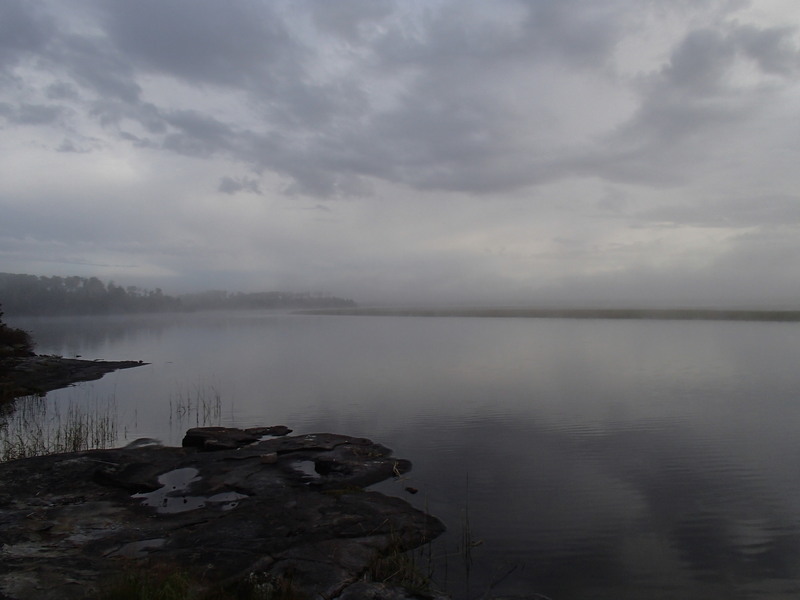 Our last trip in the region had been filled with rain and moose. This year we had very little of either. 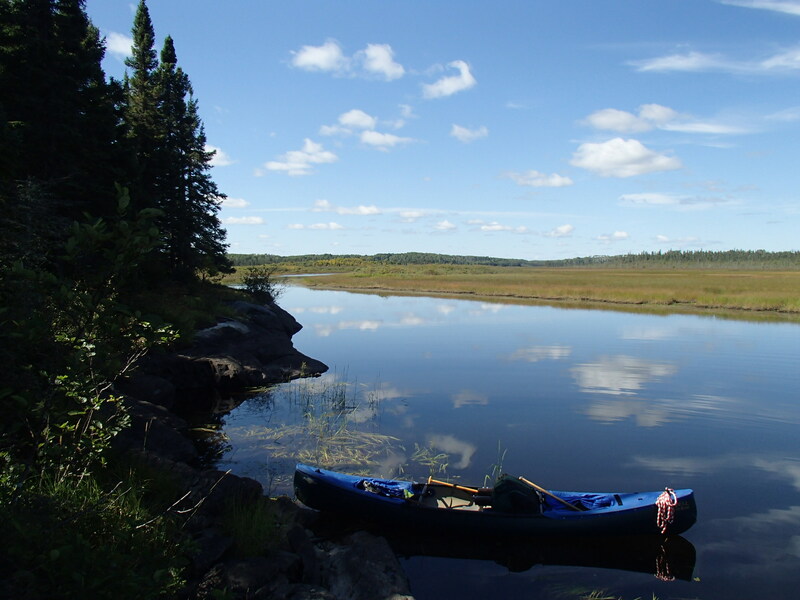 Our route took us down 3 of the major waterways in the area (the Ogoki, Kap, and Little Current). After all that downriver, we had to somehow return to the road. The usual method involves a float plane. 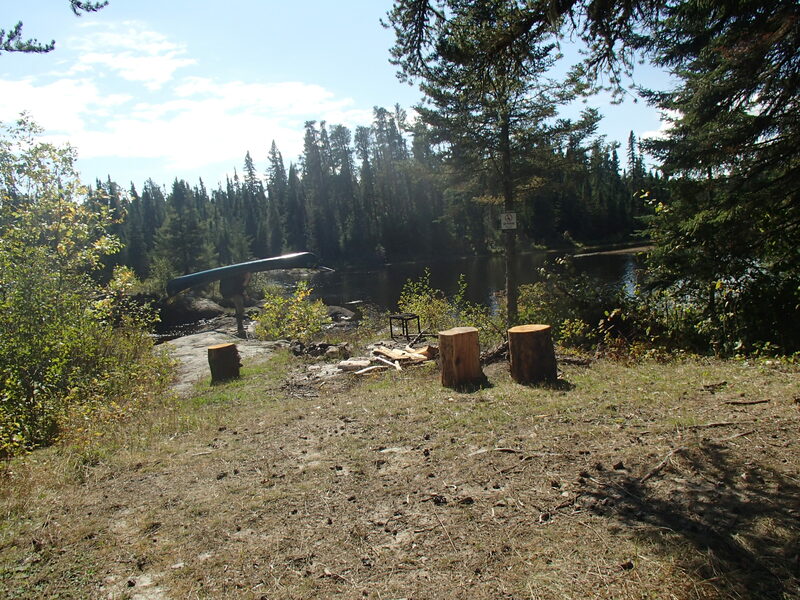 We choose to travel up the Esnagami River, and then crash through the woods to a logging cut which then accessed a road. For the entire trip there was a bit of uncertainty about this last stretch. We set off on Aug. 28th. Our starting point required a somewhat lengthy shuttle from Nakina. Kate once again was a good sport and crammed in the back “seat” of my Tacoma to make room for our shuttle driver. 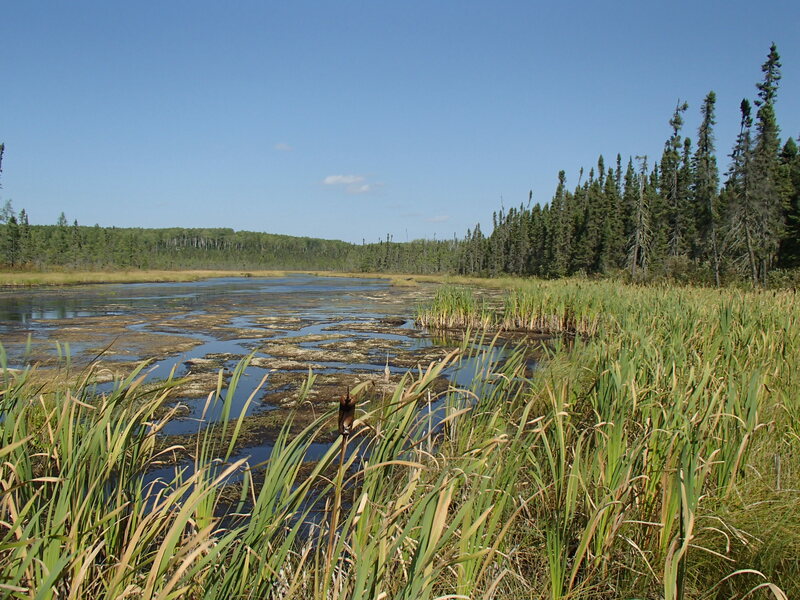 The Ottertail was a small river surrounded by low marshes. Our sky was overcast, and now and then we would feel a light drizzle. Around lunch time we made it to the Ogoki River. 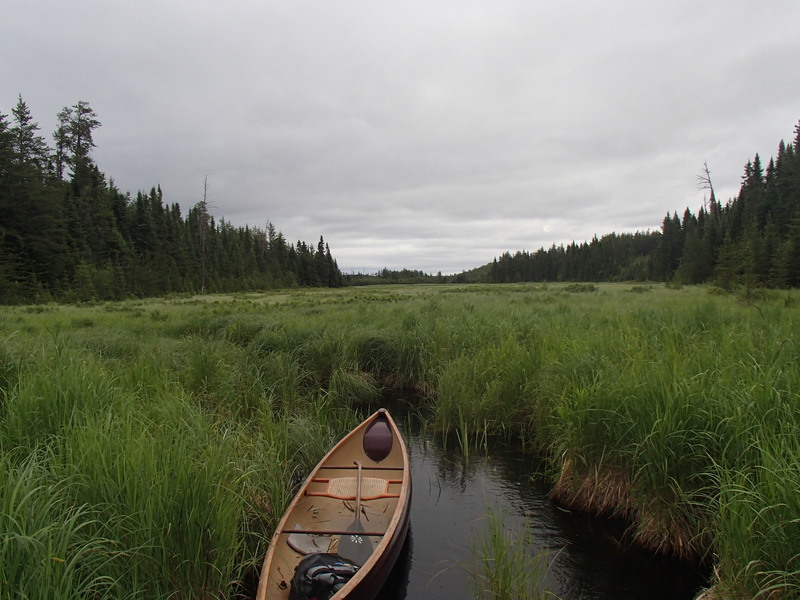 The Ogoki at this point was similar to the Ottertail, but much wider. 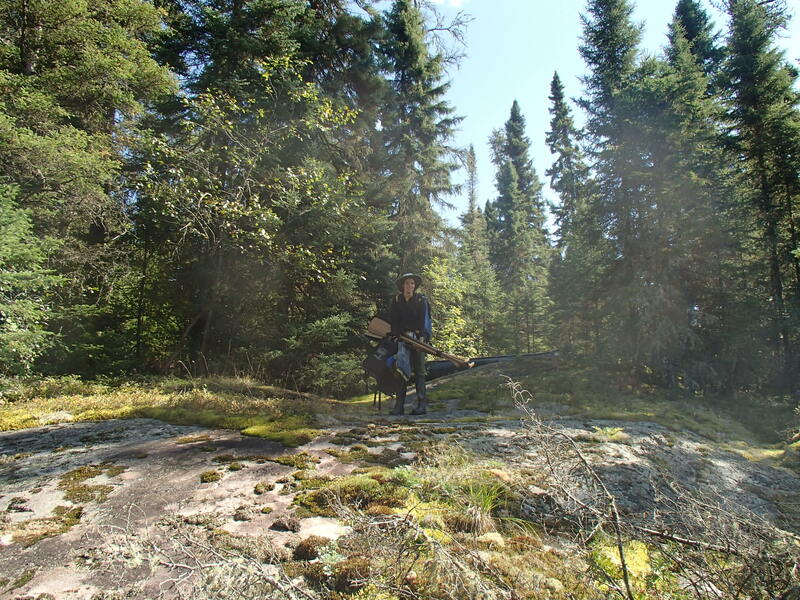 We stopped for lunch on a rare rock outcropping. 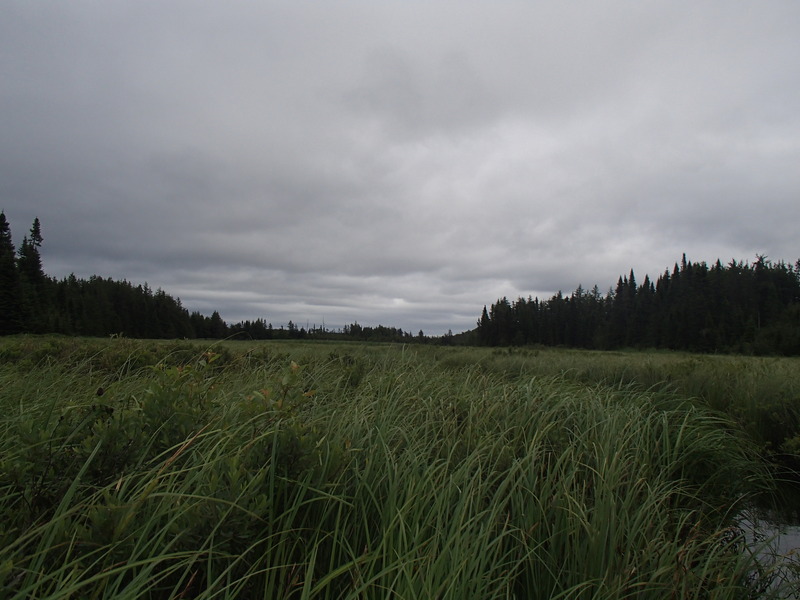 As we made our way down the Ogoki, the shoreline alternated between low marshes and rocky ridges. There was little to break up the day, and we made good time. 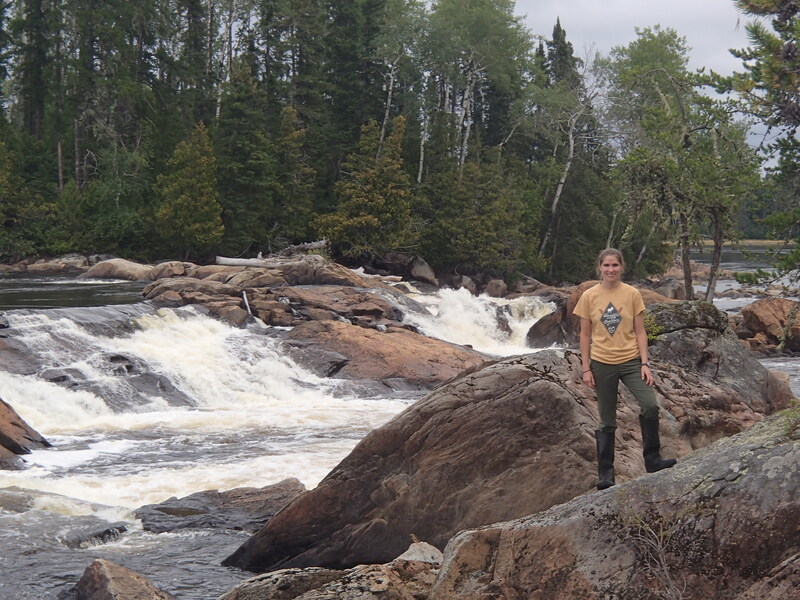 Our tentative plan was to shoot for Amy falls before making camp. The falls were spectacular. 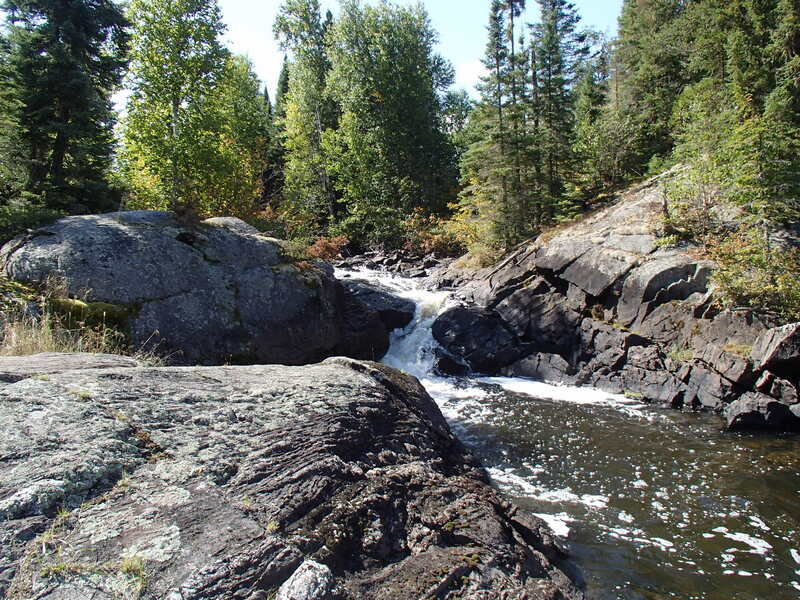 We landed on the shore opposite the portage to crawl around on the rocks and view the falls. 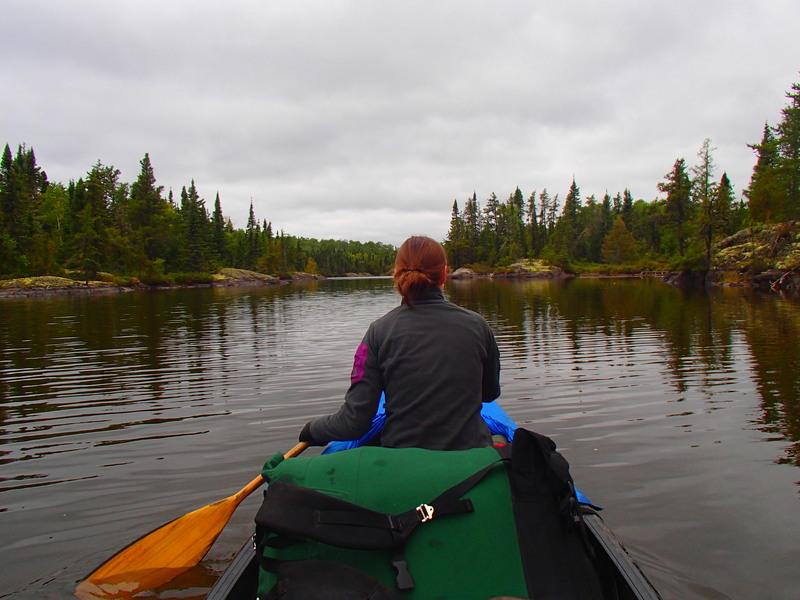 When we paddled across to the portage we met a group of three people. 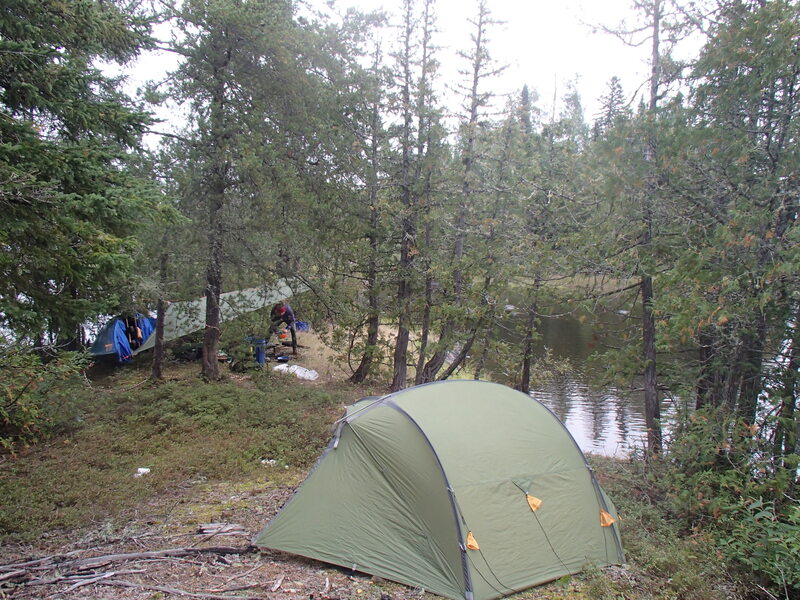 They were camped on the downstream side of the portage, and had come up the entire river over the last 40 days. In a motor boat! 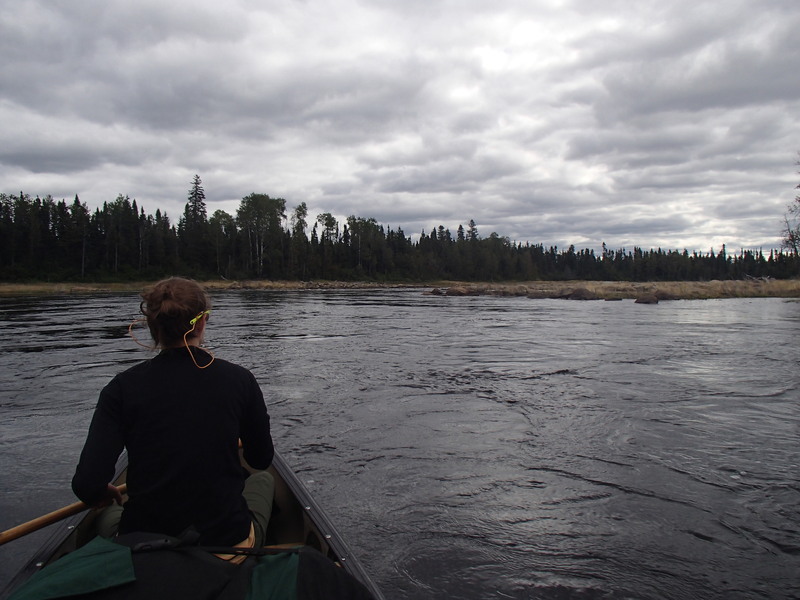 They were conducting a survey of river sturgeon, and were in the processes of preparing the portage to drag their boat across. We talked to them for awhile, and then continued on our way. 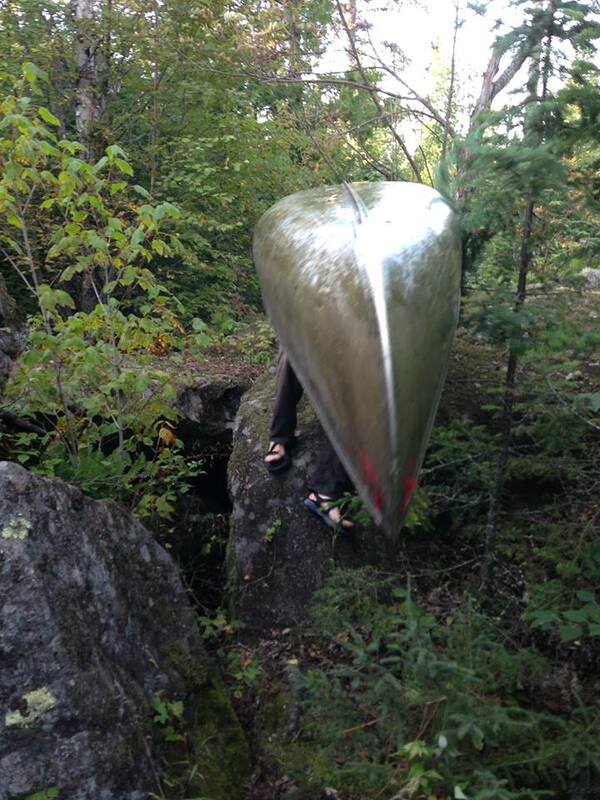 After another 5 miles, we found a flat rock next to a rapids to make camp on. We enjoyed a clear night, and had possibly my favorite animal encounter to date. The next day the Ogoki started to speed up. 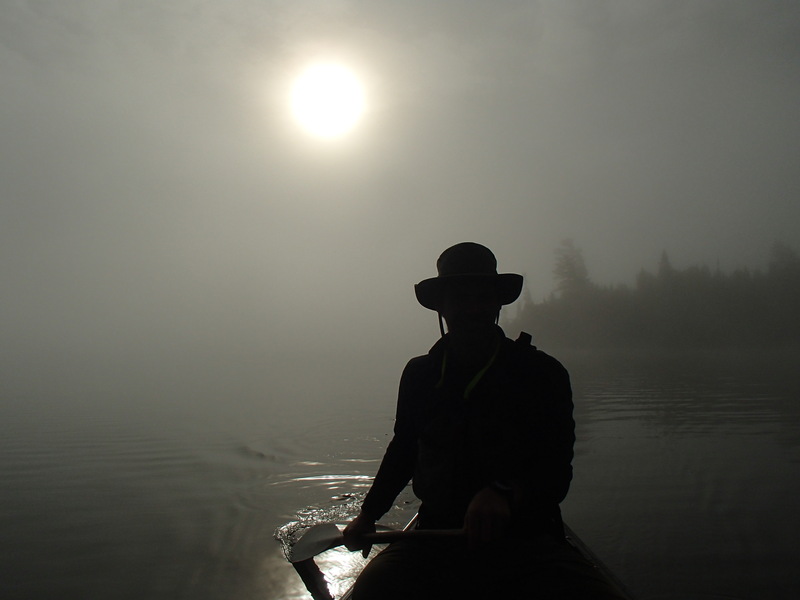 For much of the day we paddled easy but constant ripples and small rapids. The fast sections were separated by wide slow areas. 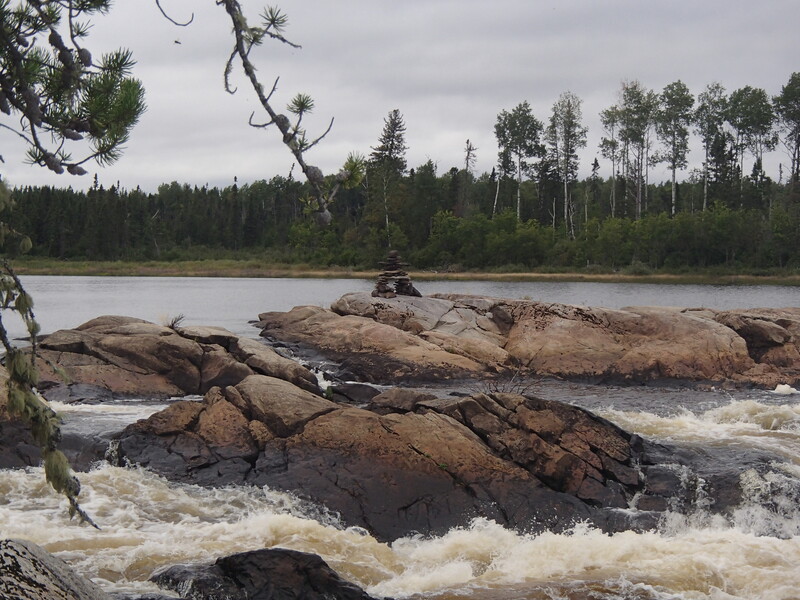 The banks were mostly sandy, but the river was full of boulders. We made it to Ogoki Lake by around 3:30. Ogoki is a large lake, and a wind had come up. 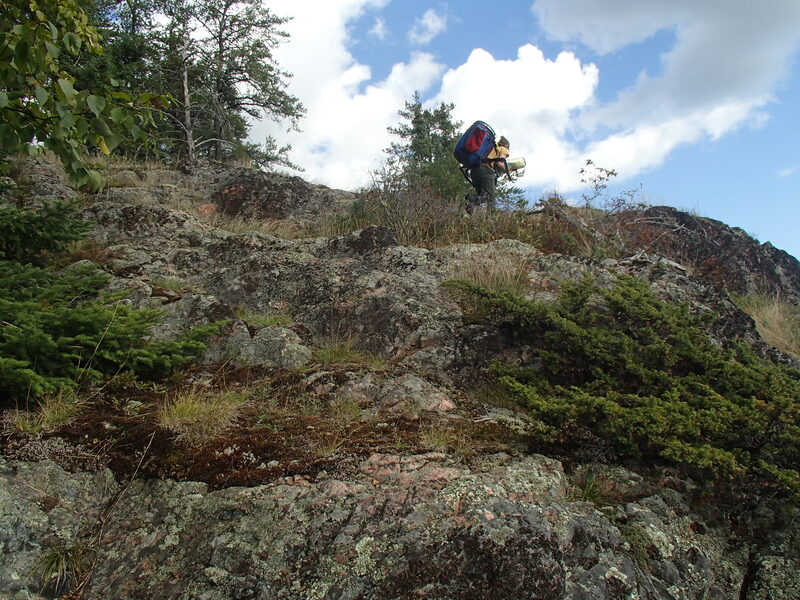 The terrain had changed to more typical Canadian Shield bedrock. 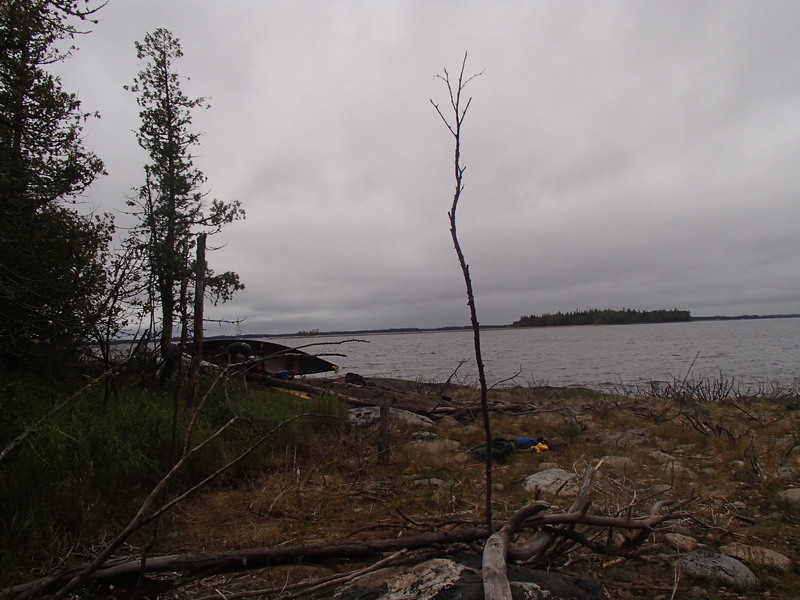 We made camp on an island about a third of the way across the lake. 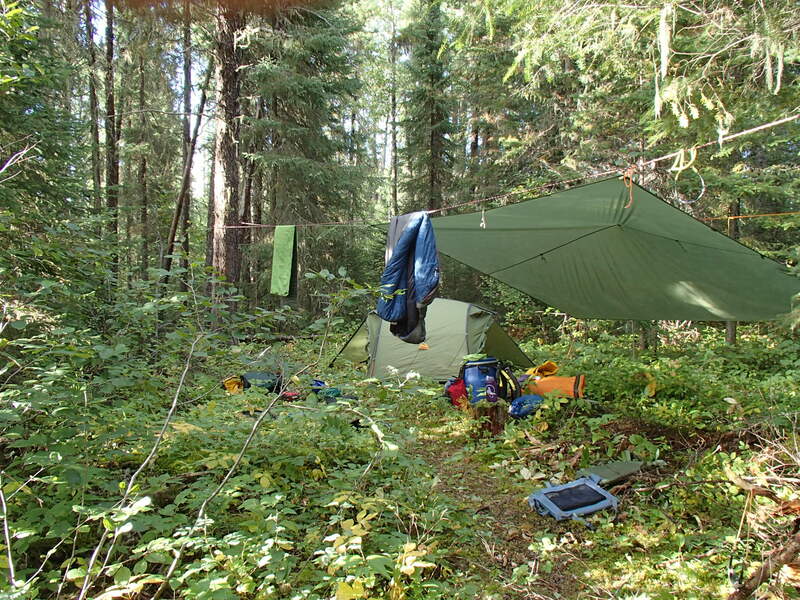 It took a little work to make a tent pad, but we were able to find a flat area sheltered from the wind. During the night the wind picked up, and in the morning it had shifted. It was now coming out of the NW, which made for a confused crosswind for much of the remaining lake crossing. We set off in the wind, bobbing around in the large waves. About half way to the narrow section leading to Kayedon lake it started to rain. It was a fairly unpleasant crossing. 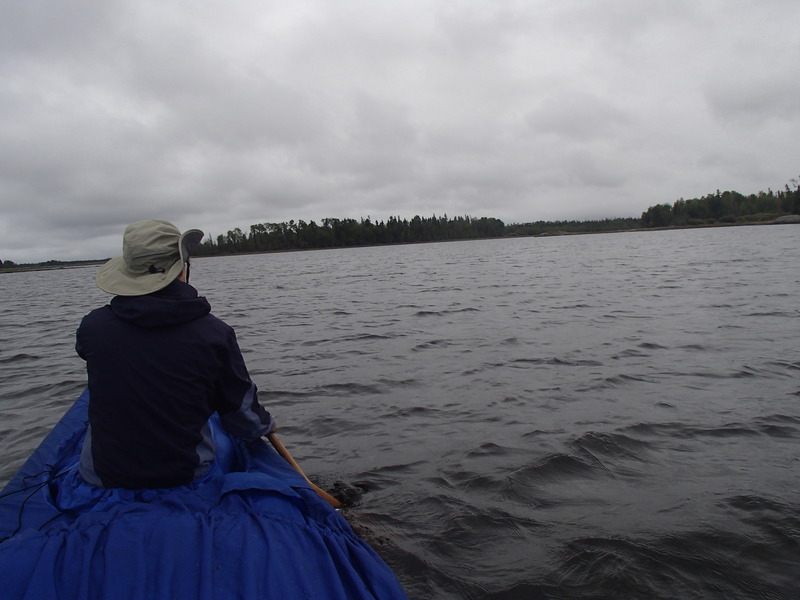 Once we were on Kayedon we stopped to bundle up a bit more, and then paddled the lake. 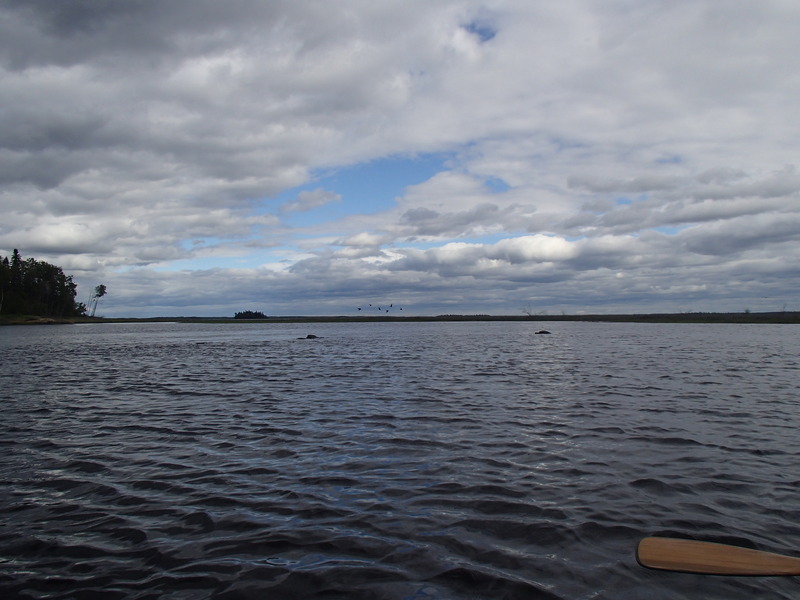 A float plane landed in front of us, and taxied over to the fly-in camp on the lake. 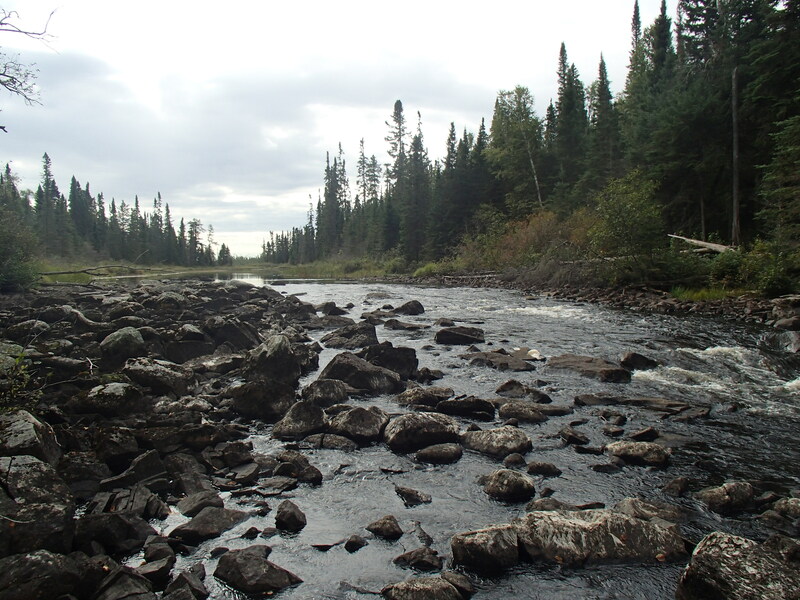 A small stream runs into Kayedon on the southern shore. 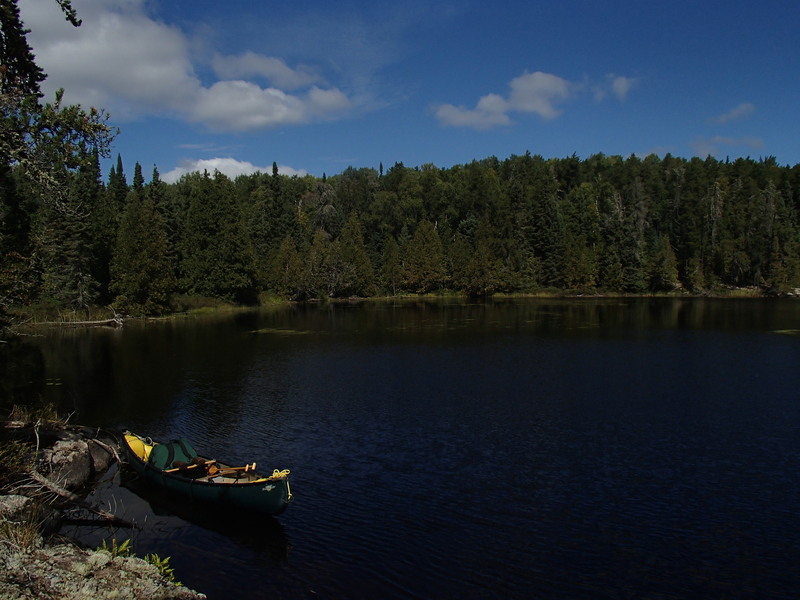 We poked our way up it towards the long portage to Kapikotongwa Lake. 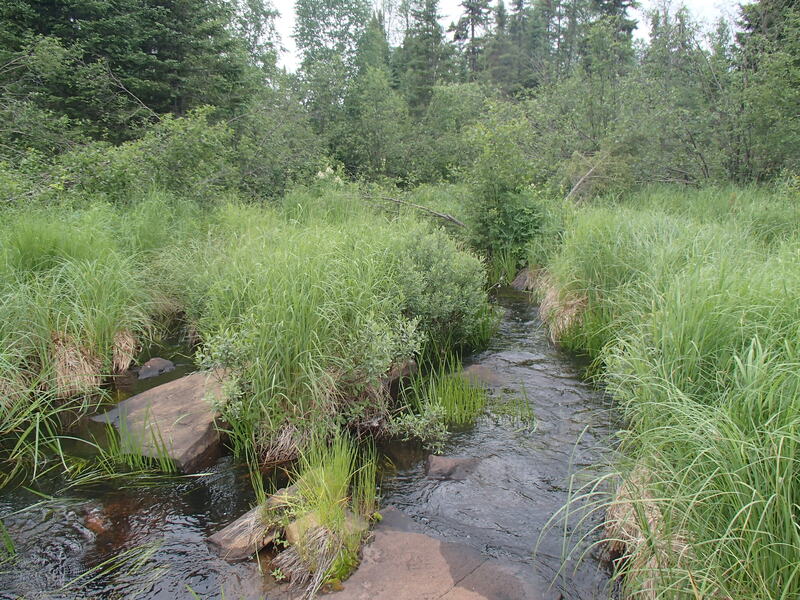 Eventually the stream became shallow, and it was easier just to line up it. At the end of the creek we paddled a small lake and then found the portage. 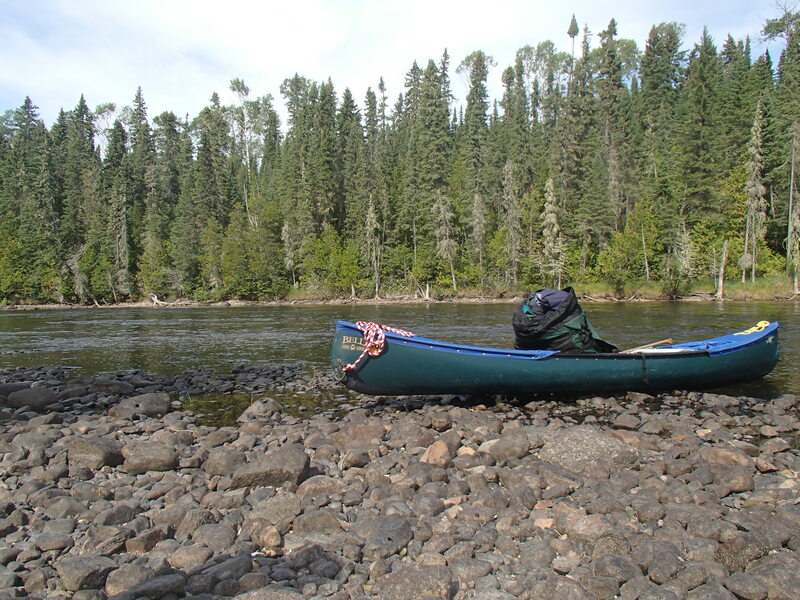 The portage was in good shape, and fairly dry. 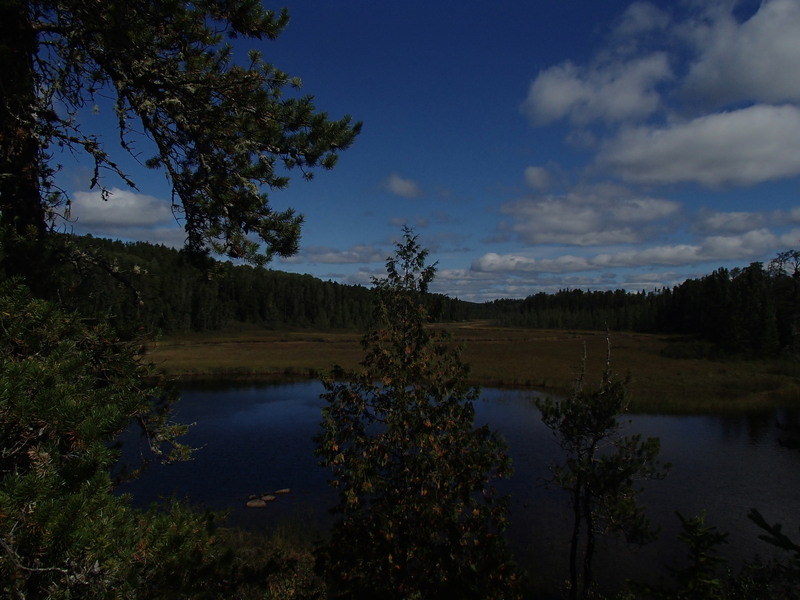 Areas of the trail were full of cranberries. Up to this point in the trip we had done very little portaging, and my legs needed a wake up call as we made our way up the first hill. We took a couple of breaks, but made it across. 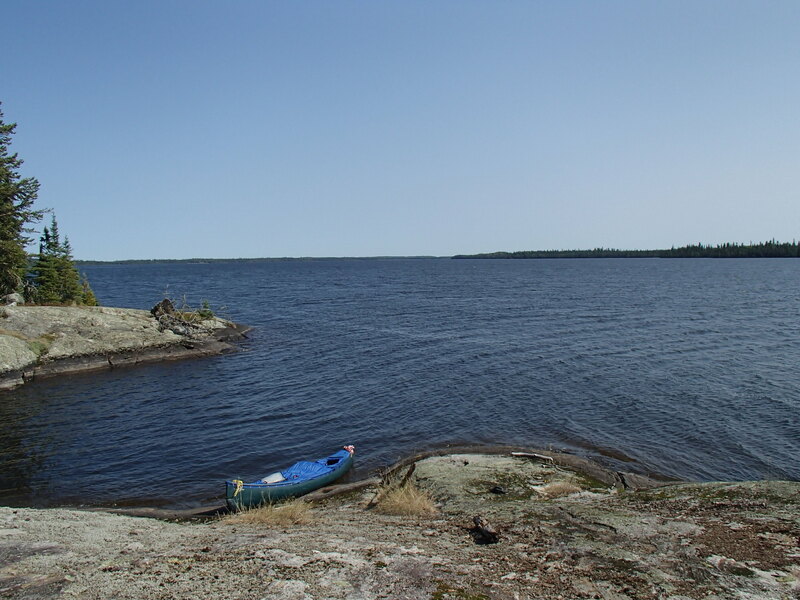 We ate lunch on Kapikotongwa lake. 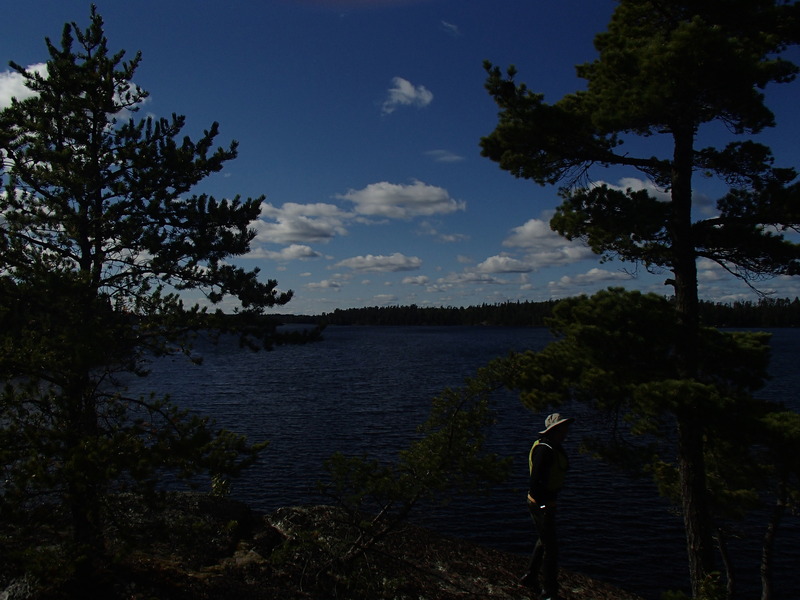 The next run of lakes on the way to Briarcliffe were stunning examples of Canadian Shield. 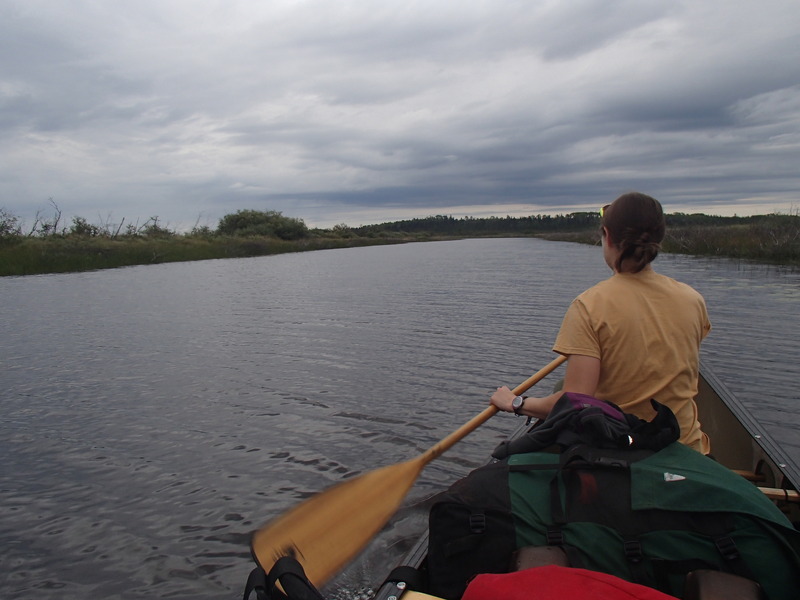 We found the portage to Briarcliffe, complete with a portage sign (thanks Rob!). 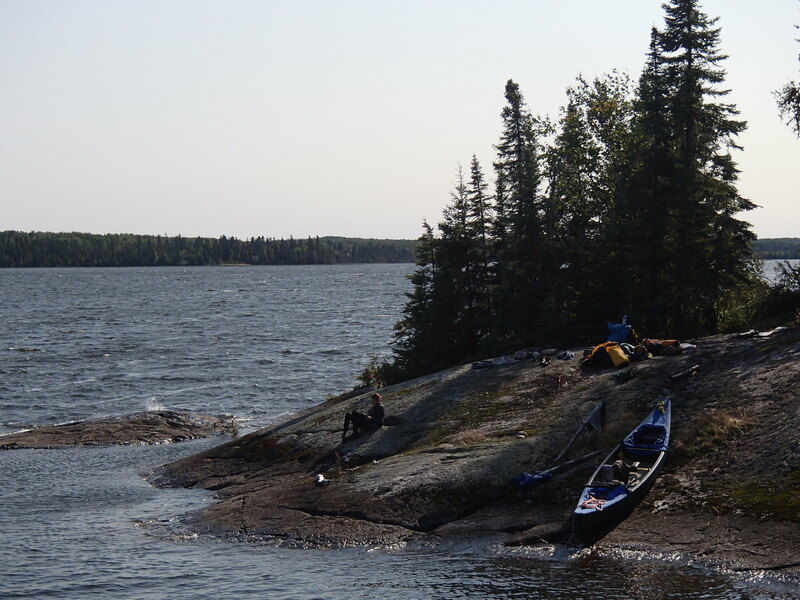 We set up camp on a rock point on the west end of the lake. There was an on and off light drizzle, and a strong wind. 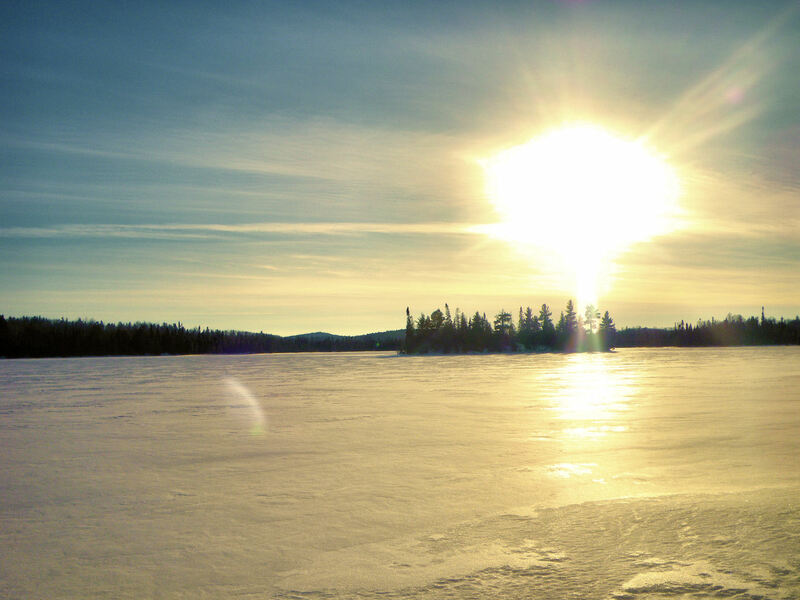 As the sun went down, it was downright chilly. The next morning the clouds cleared after breakfast, and we had what might have been our best day of the trip. 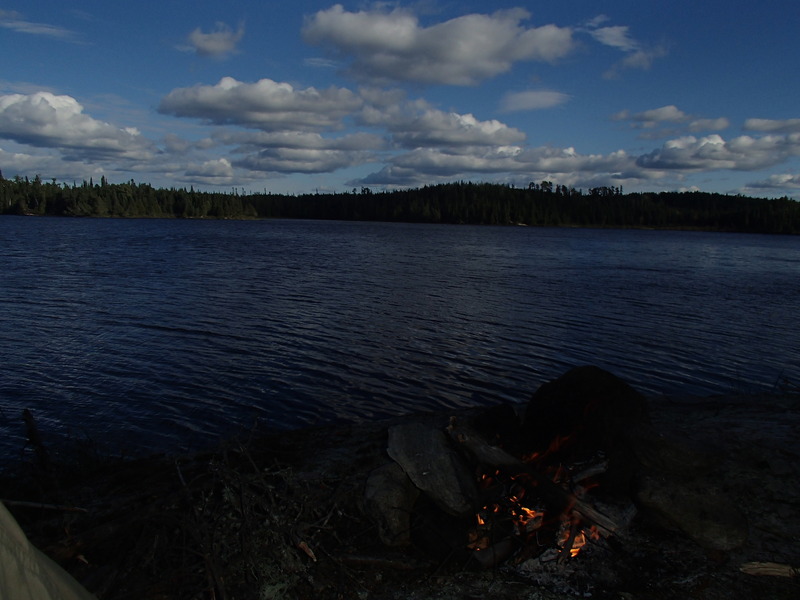 The remaining lakes where my favorite of the trip, especially Saga Lake. The narrow waterways connecting them often had high rocky sides and small swifts. 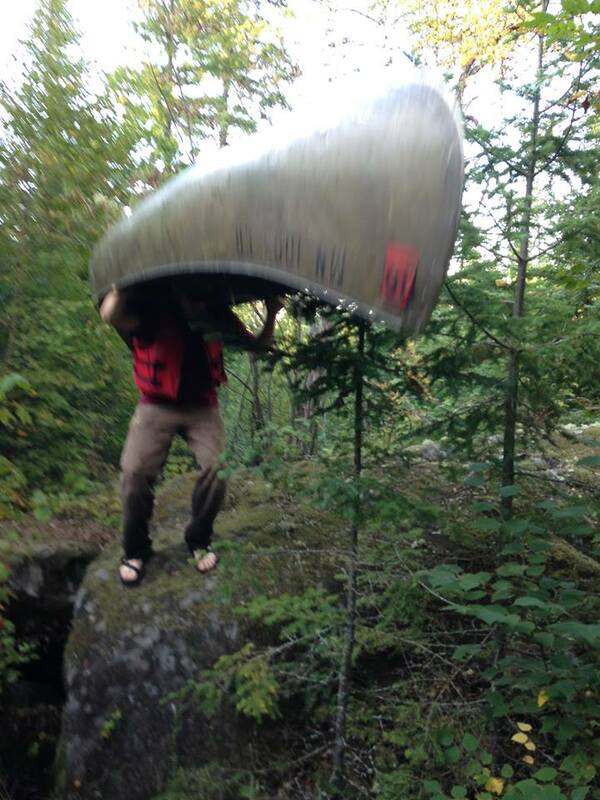 We had some fun easy white water once we were on the main river section, as well as some small swifts. 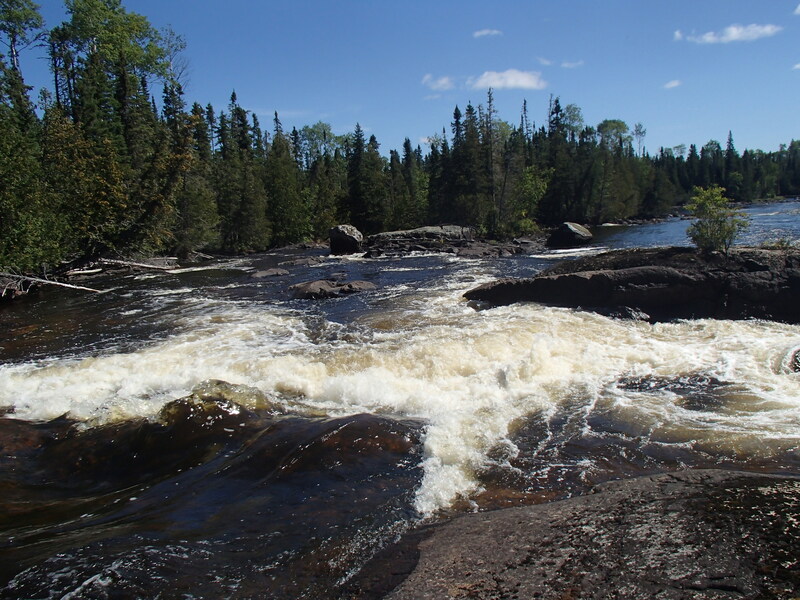 We made it to the first marked rapids at lunch. 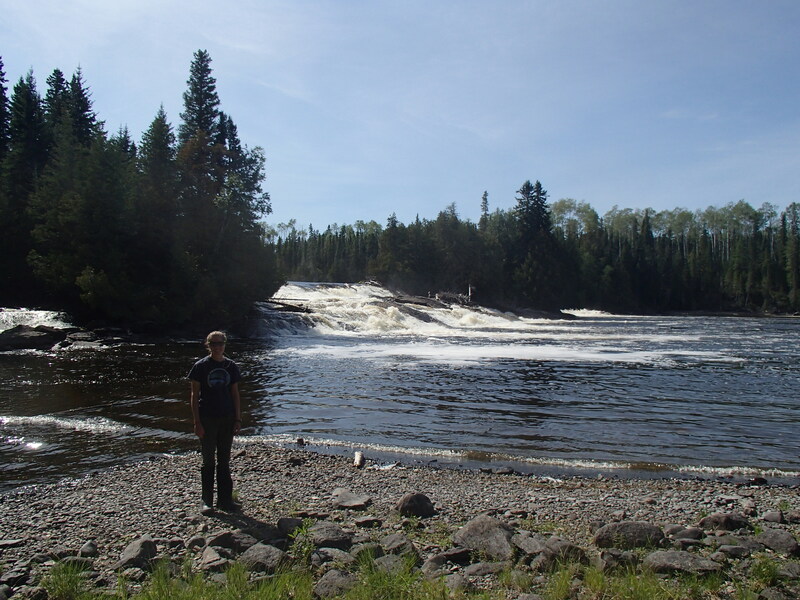 The rapids/falls was much larger than I expected. 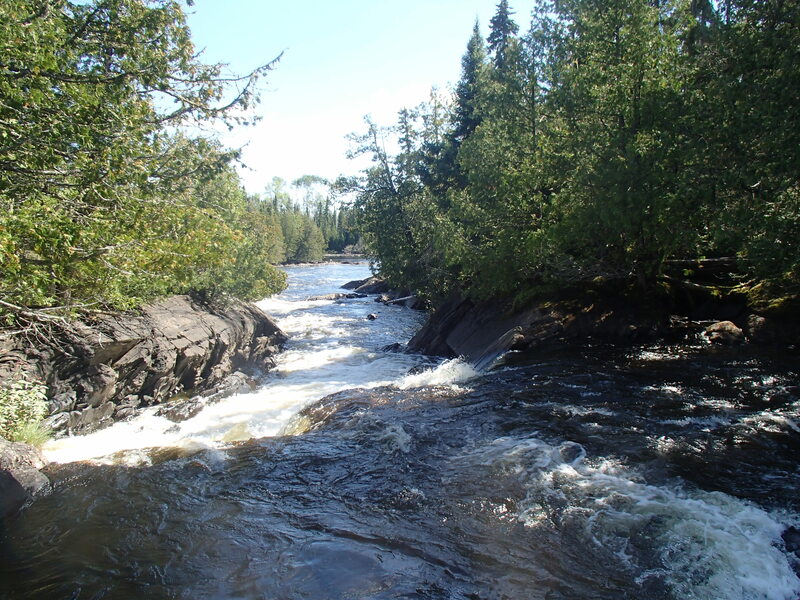 We ate our lunch on a rock island with the rapids roaring on either side of us. 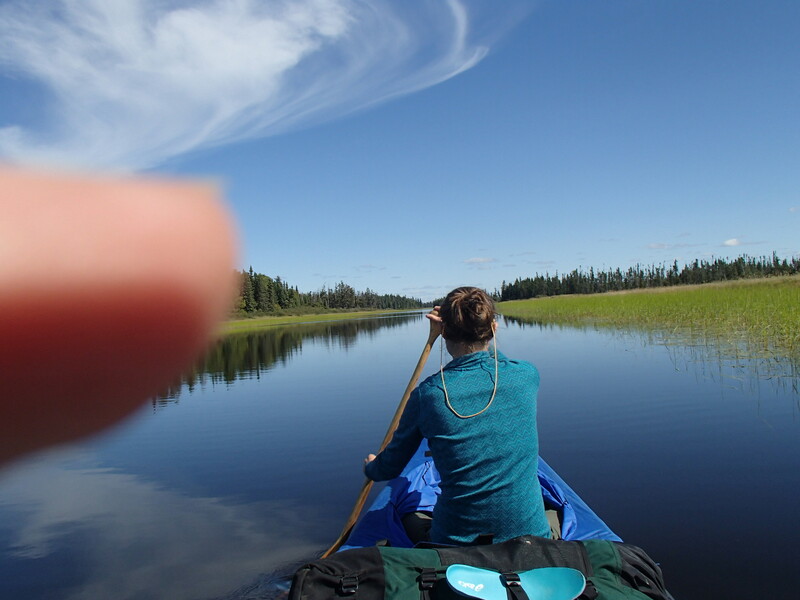 At this point, I realized that I had accidentally left our camera on in my pocket, draining most of the batteries. I became very judicious with its use in order to save batteries for the Little Current. Unfortunately that meant not documenting much of our most scenic day. 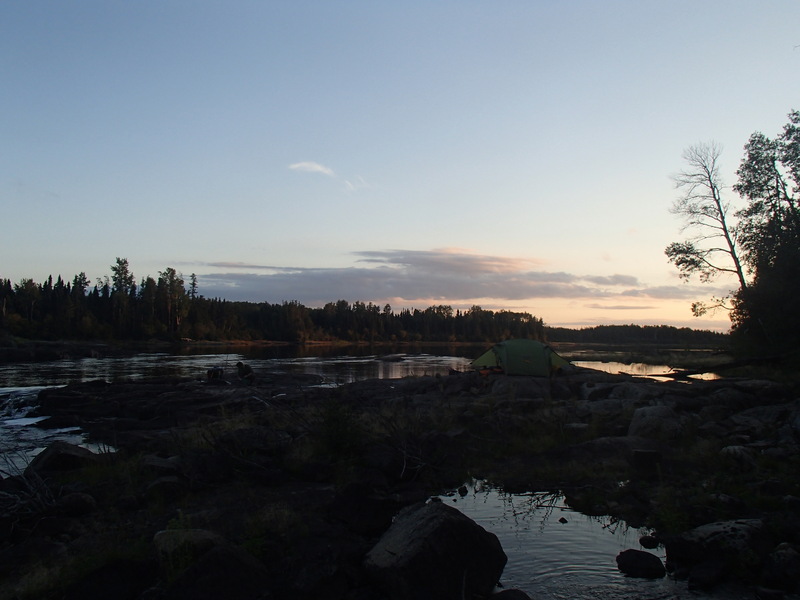 Anyone wishing to see the lower Kapikotongwa will just have to paddle it themselves. 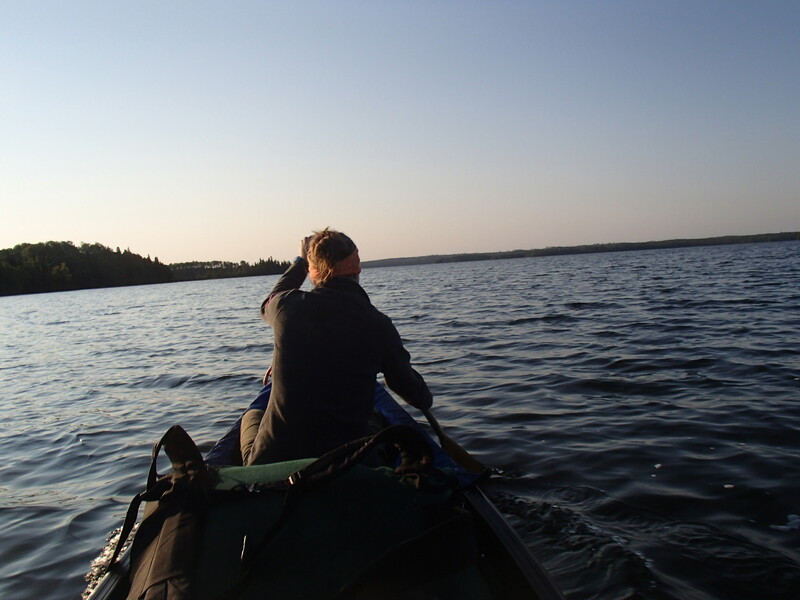 We did not find portages on the Kapikotongwa. I may have had wrong information, or they may have been covered with trees from a blowdown. 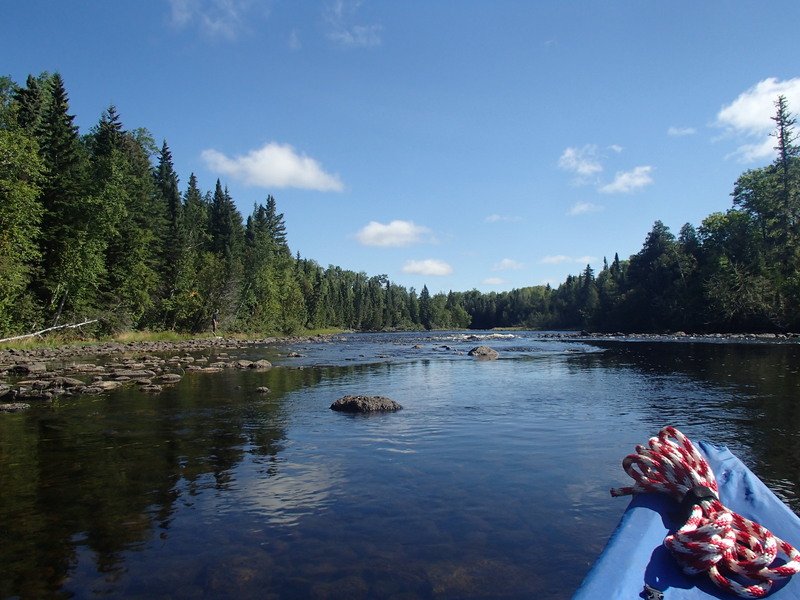 We made our way down the first two large rapids through a combination of lining, carrying through the woods, and some paddling. It was slow going, but I was grateful to be at the rivers edge with the scenery, not back in the woods walking around it. 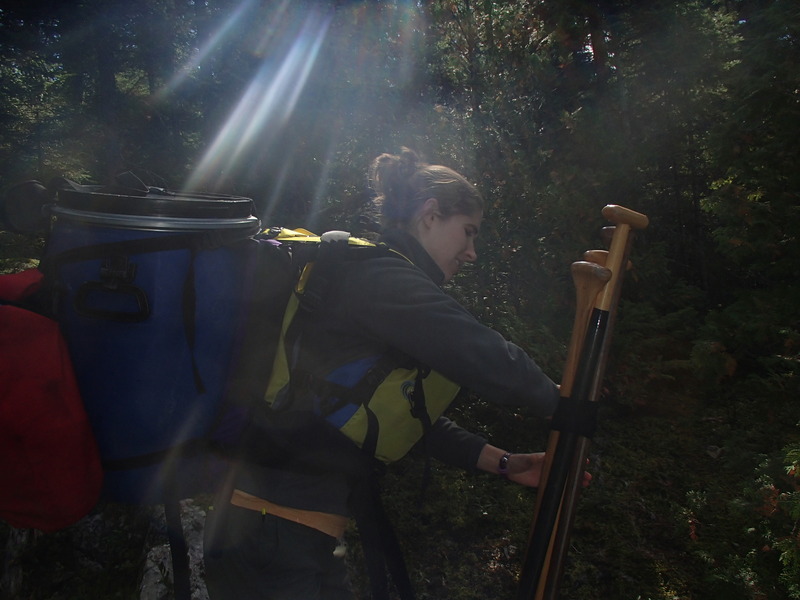 After scouting the third marked rapids, we determined we could run it. 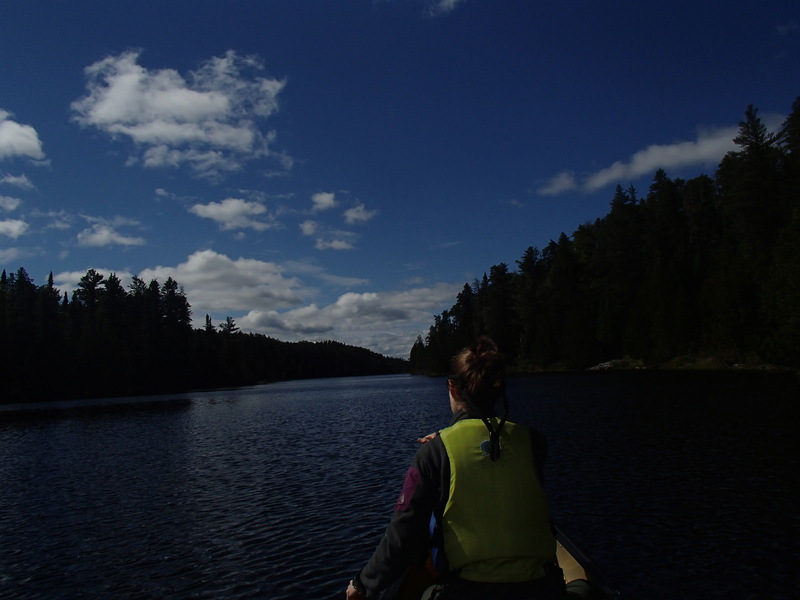 It was a little more ledgeish than we usually paddle, but we ran it without incident (because we are a lone canoe, in remote areas we are pretty conservative about what we run). 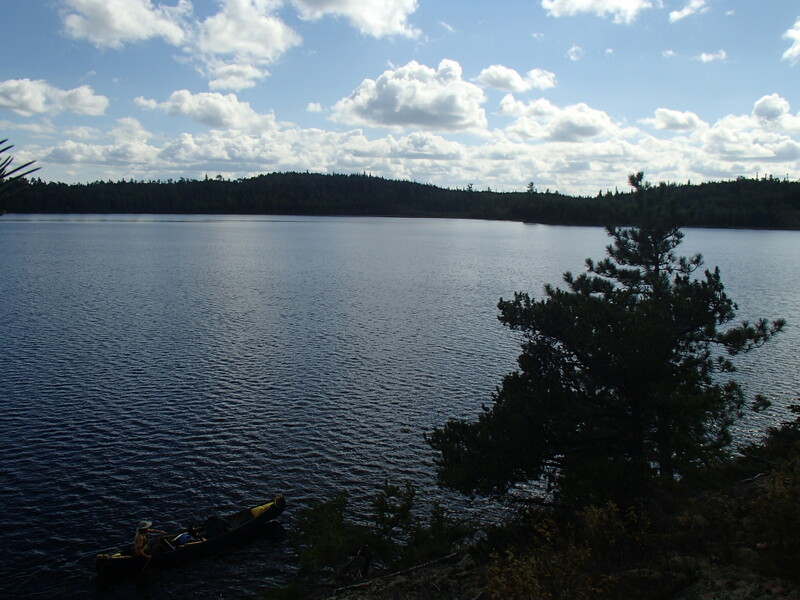 After a long section of swift water we made it to Percy lake. 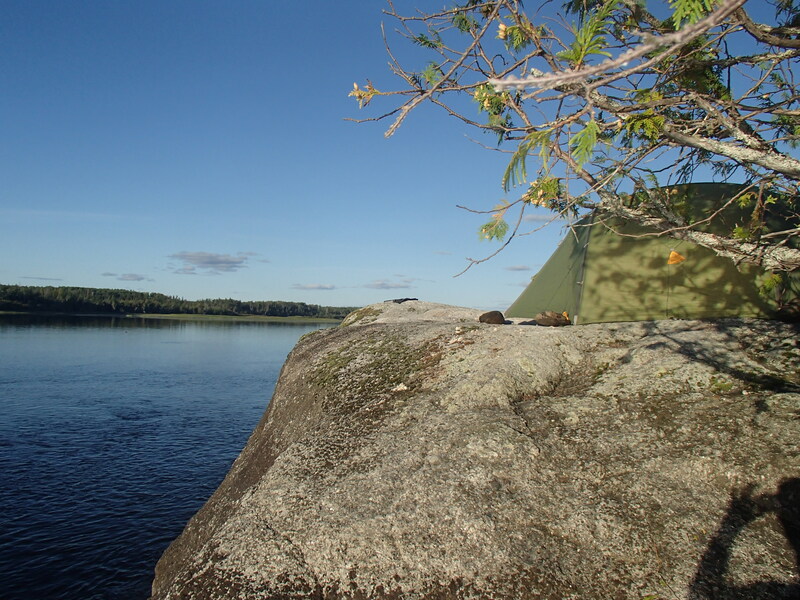 We camped on a small island with a high rock overlooking both the lake and river. That night we watched swirling northern lights. 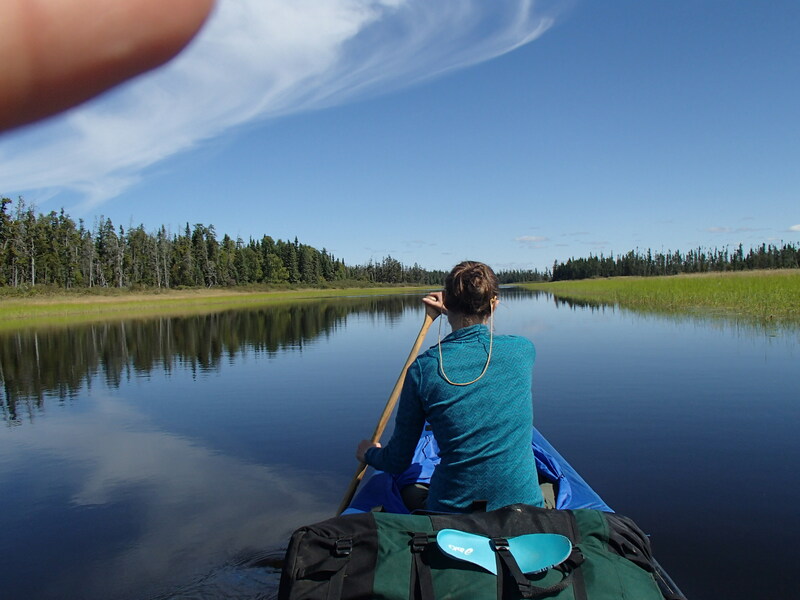 We paddled Percy lake the next morning, and hit the Little Current River. The river was wide to start. After a couple miles the current picked up and the shore became lined with gravel bars. We ate lunch on one in the middle of a swift section of water. 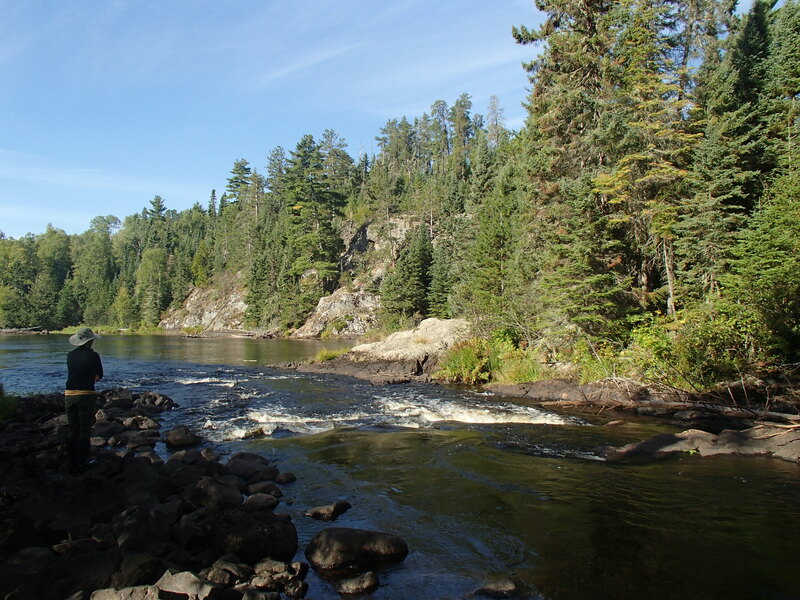 We paddled on, and came to Betty Falls. What a scenic area! 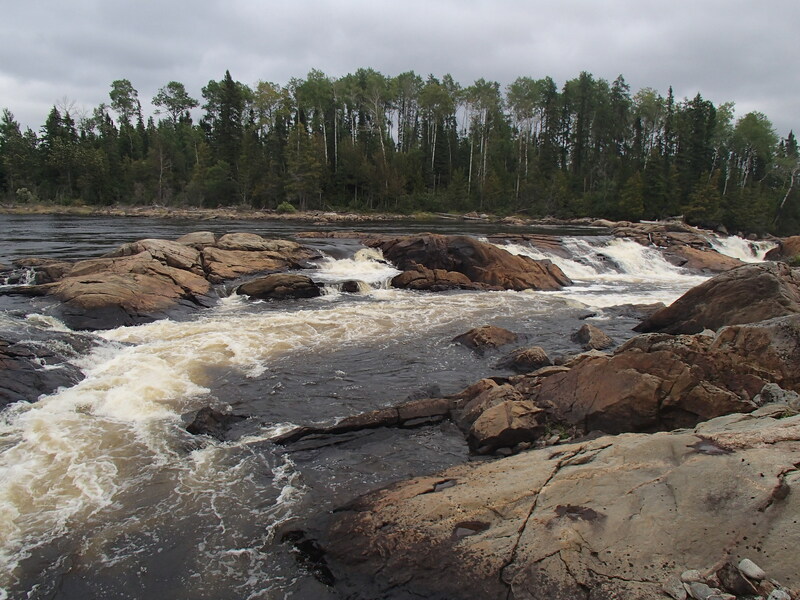 We found a good portage around the falls, and then lined the rapids at the bottom. I took the last photo of the trip We carried on to Canyon Falls, which was spectacular. 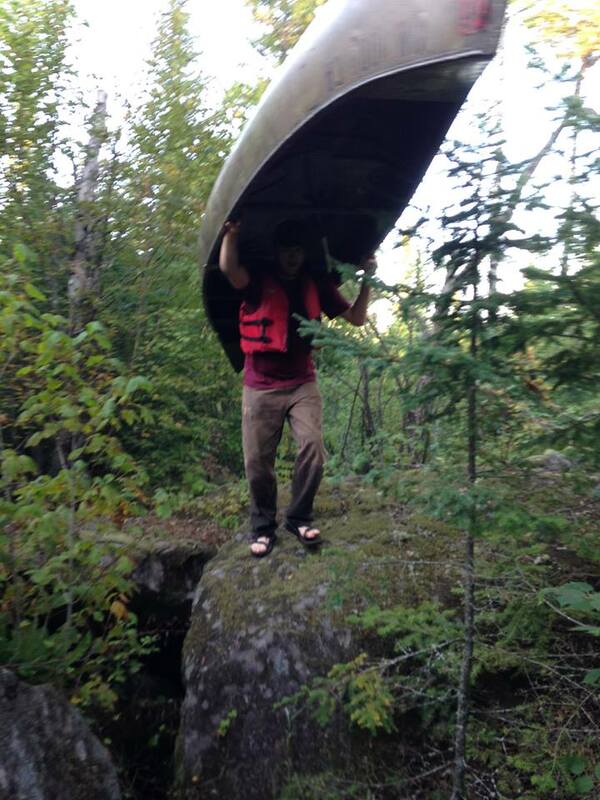 I had the portage marked on the left. 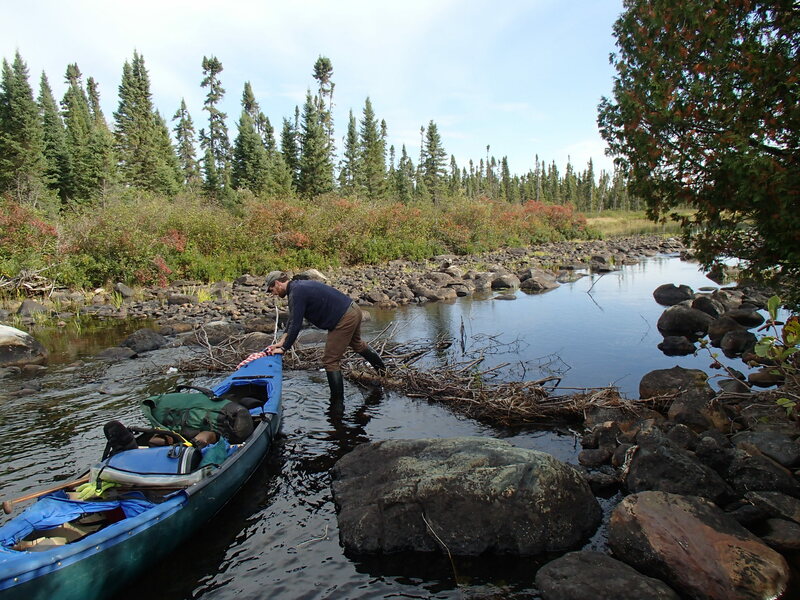 After much searching we came up empty handed, and decided to paddle back up to Betty falls and camp rather than start the long process of lining down the river. 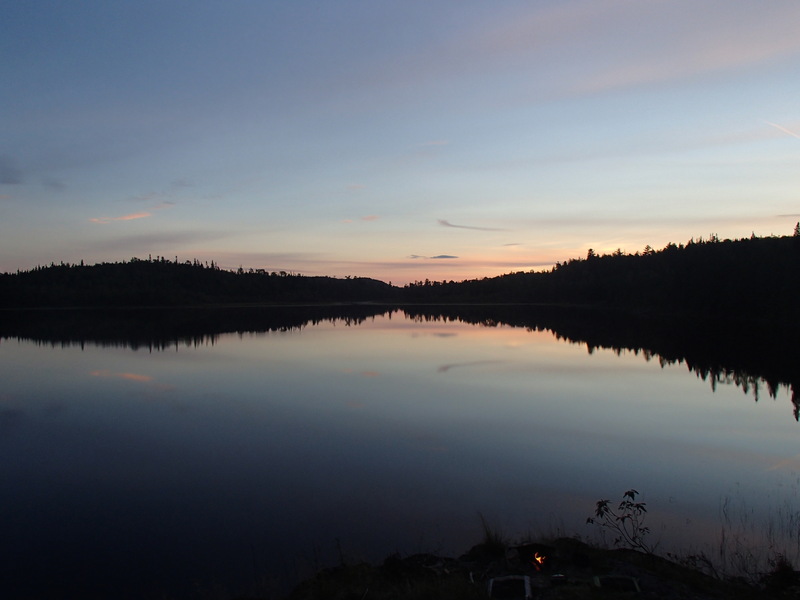 We had a great campsite and swam and relaxed. 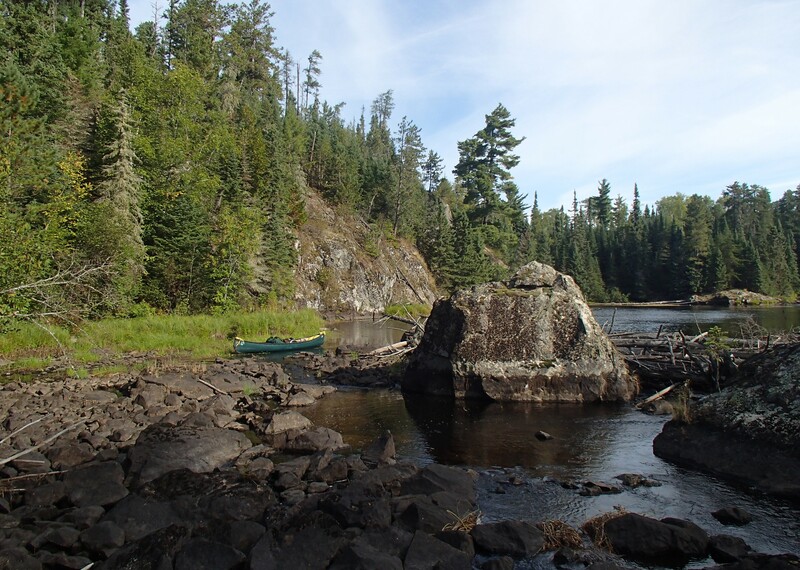 The next day we paddled back down to Canyon falls, and while preparing to line found a portage on the opposite side of the river. From here on we found good portages. Often they were short, and involved brief paddles to connect them. 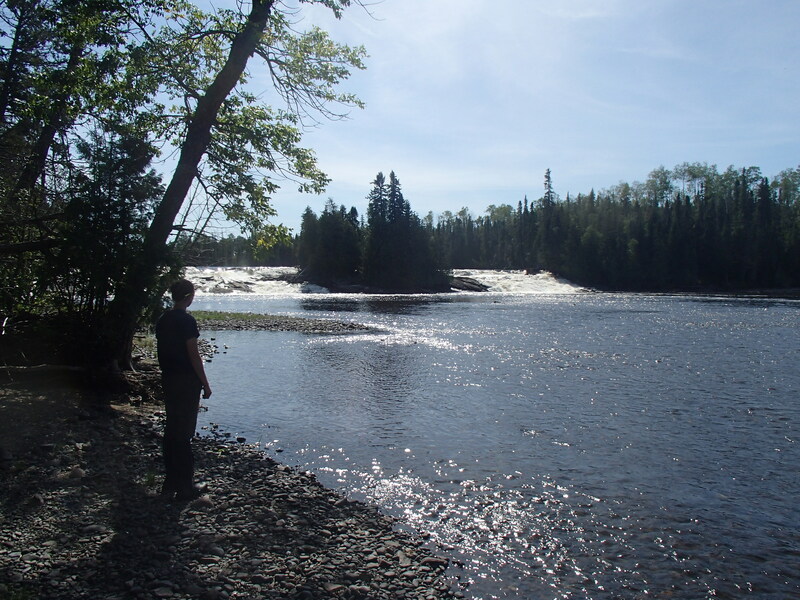 The river was full of constant current between the larger rapids and falls. 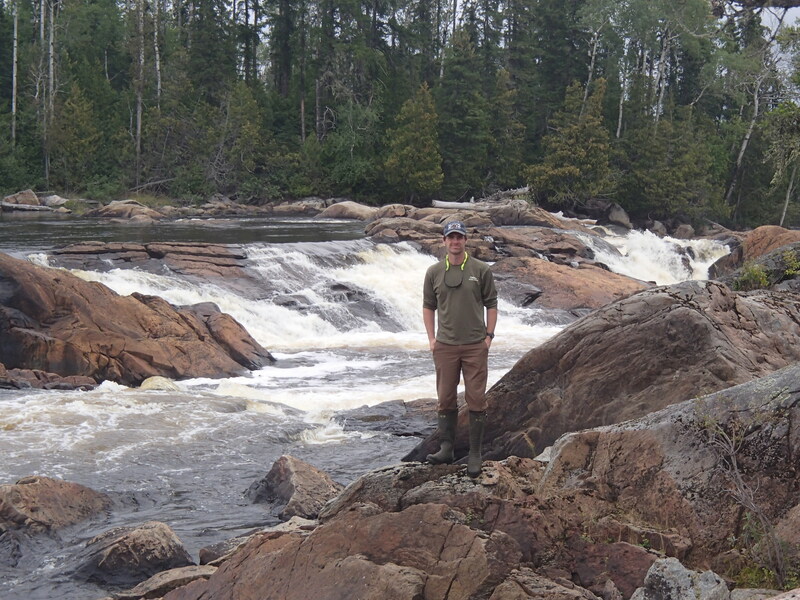 We made it to Louella Falls at lunch time and ate at the top of the portage. We were about to conclude our downstream potion of the trip. The Esnagami was fast and shallow where it hit the Little Current. 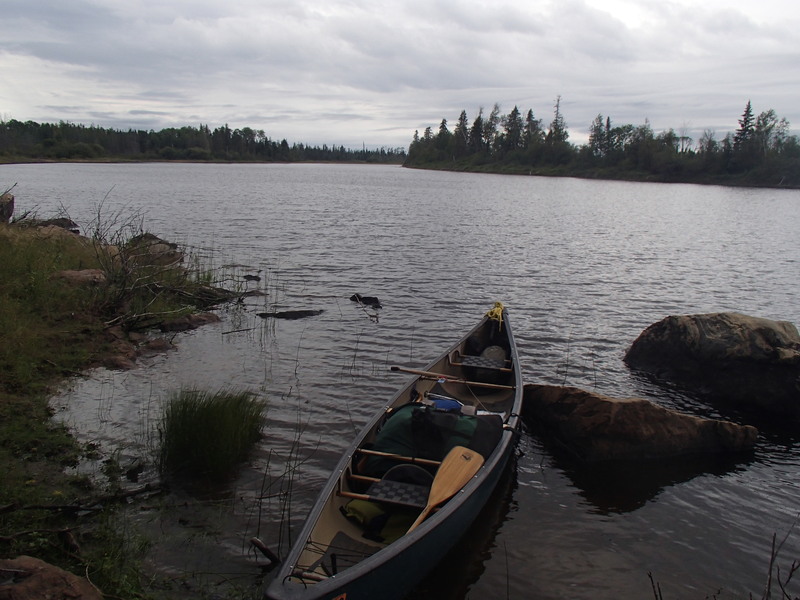 After paddling and wading for awhile, it became apparent that it was not going to slow down. 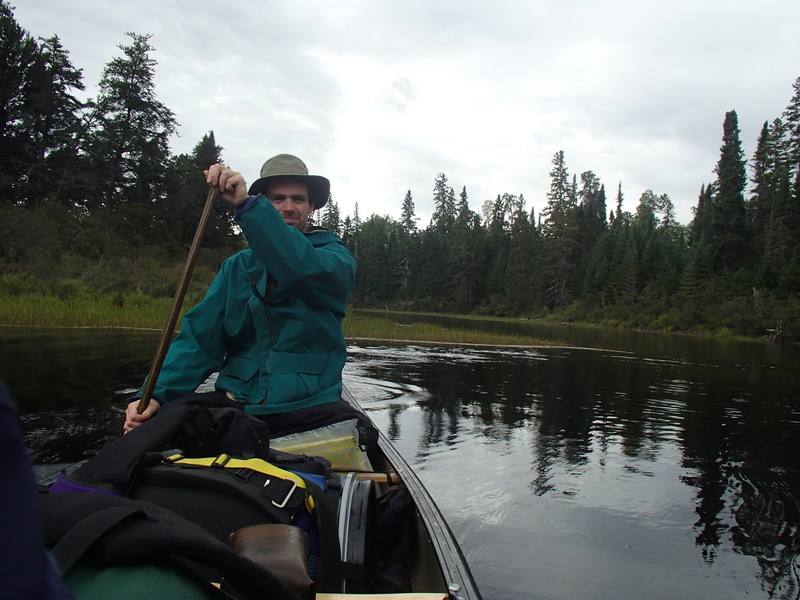 I cut a 12′ spruce pole, and we started pushing upstream. 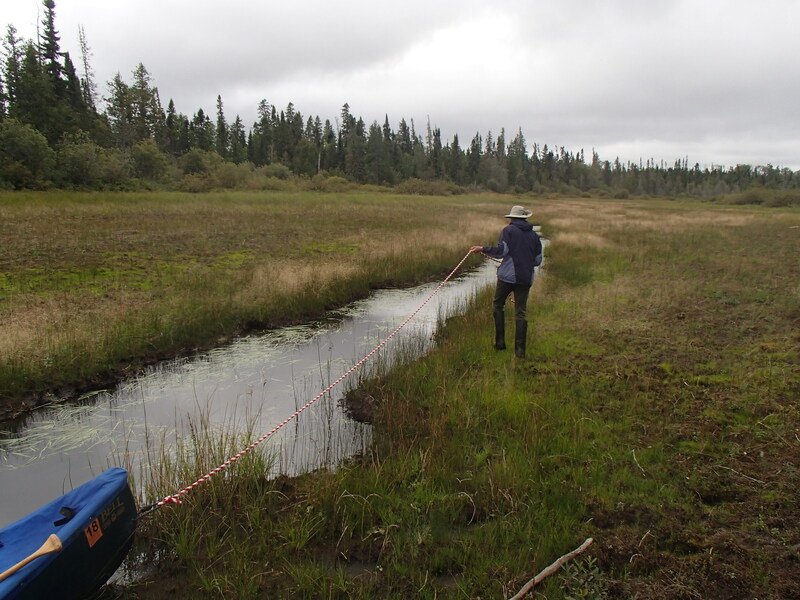 We were able to make decent progress poling, every now and again needing to get out and wade very shallow parts. Kate kept the bow in the right direction while I poled. 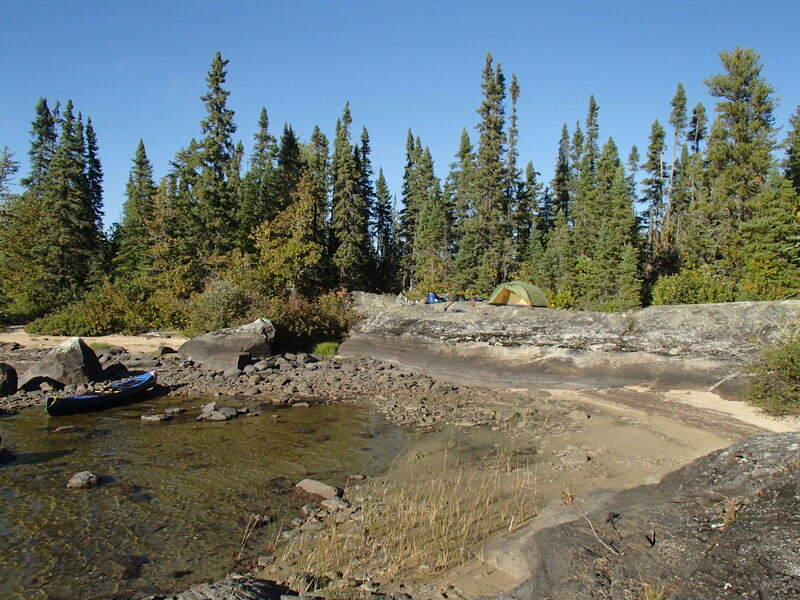 We traveled about 5 hard miles in 3 hours, and made camp at the first (last) marked rapids. 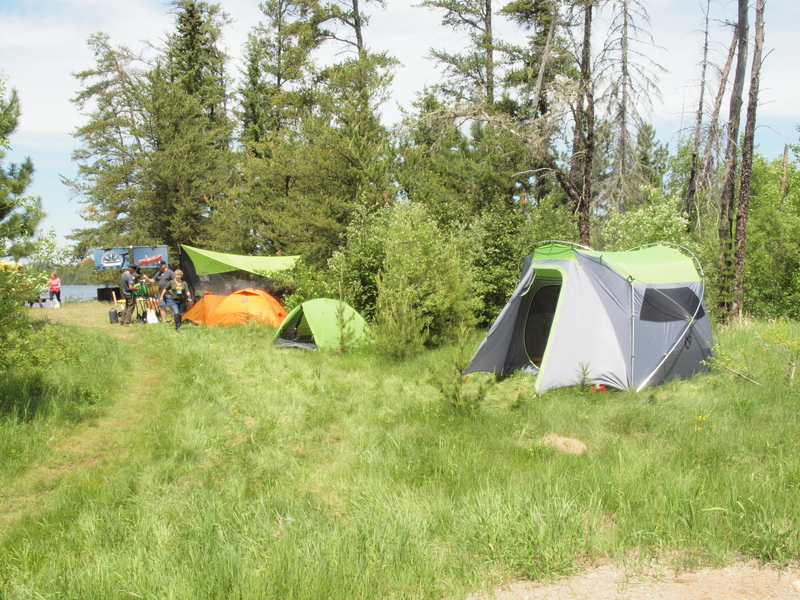 It was a lovely campsite. We swam and read, and both easily fell asleep. The next day it was back to poling. In spots the river was deeper, and travel easier. For brief sections we could both paddle (for anyone interested, I had a gps on for this section. 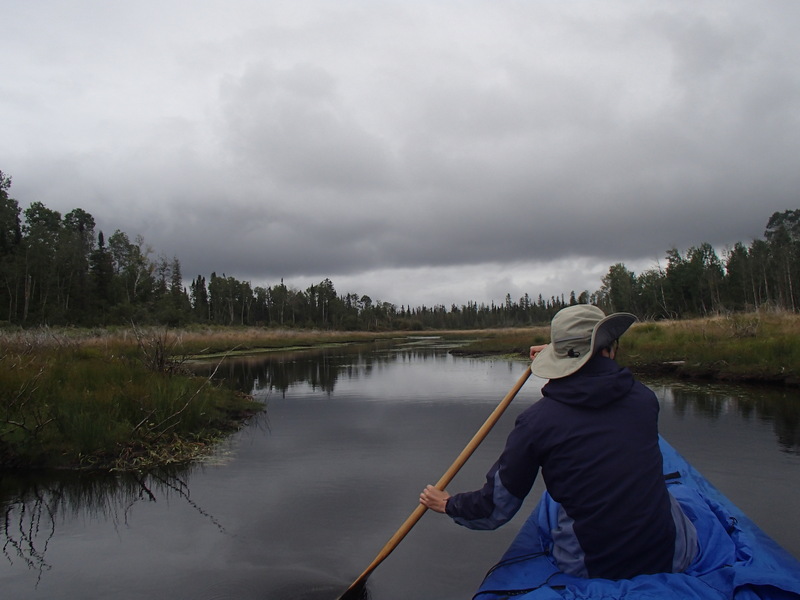 When paddling we moved at about 3.5 mph, poling 2.5mph, and wading 1.5mph. Roughly). 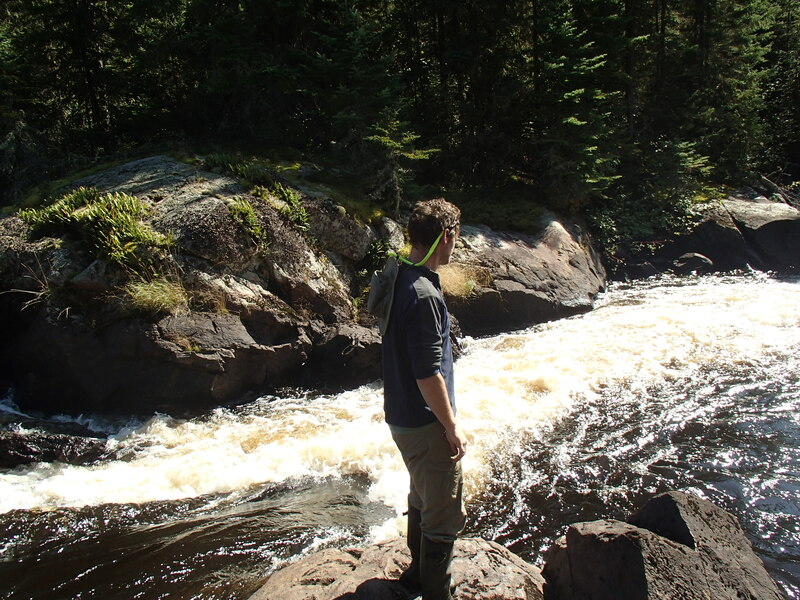 We also had a few larger rapids to negotiate. At around 11 we made it to our take out point. 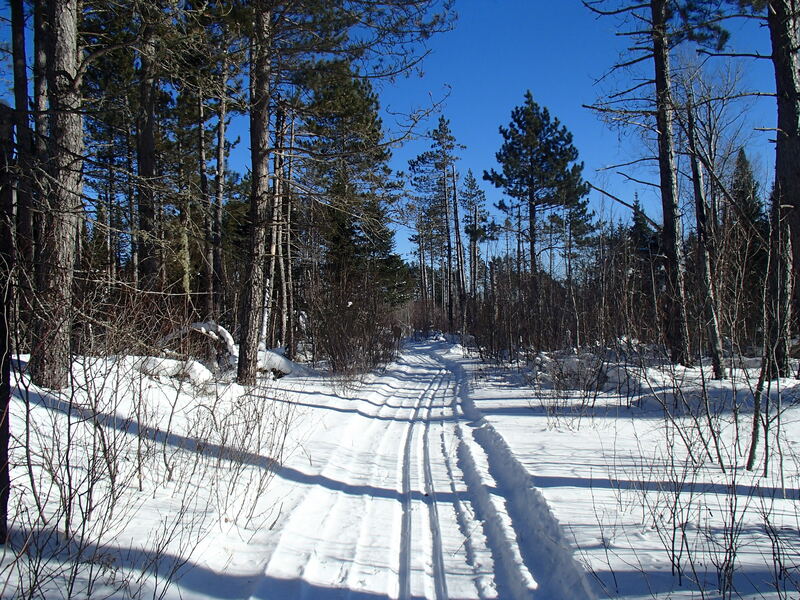 Our take out involved a short bushwack to a logging cut where we would eventually hit a winter trail that would take us to the road. It worked, but not without a lot of wandering around in an overgrown cut. We eventually found our trail, and made it to the road. 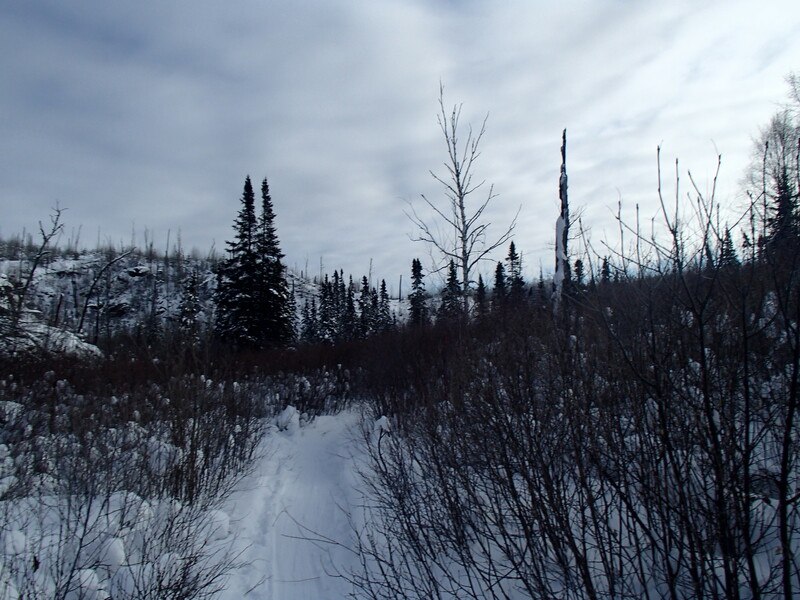 We found the truck another mile or so down the road and drove it as close as we could to the winter trail. We were very thankful that our shuttle driver had left a bottle of water in the cab. 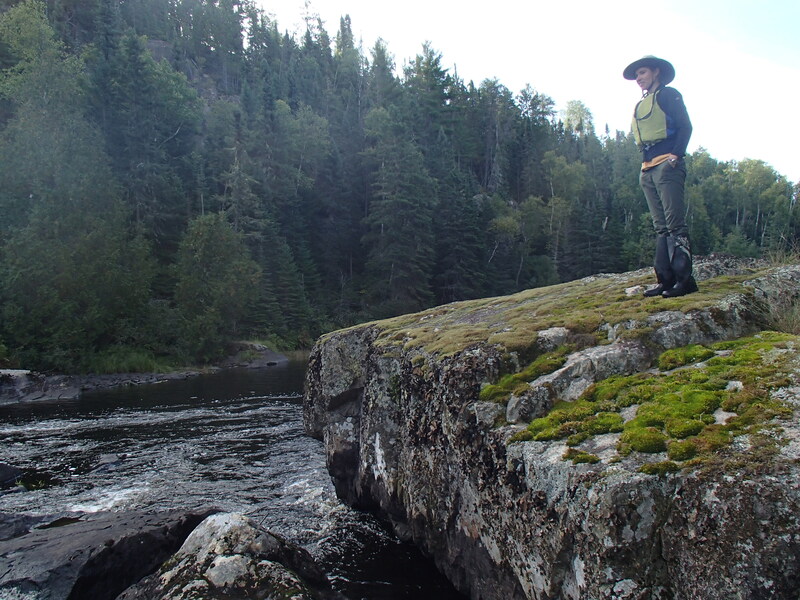 We backtracked to the river, figuring out our best path on the way. 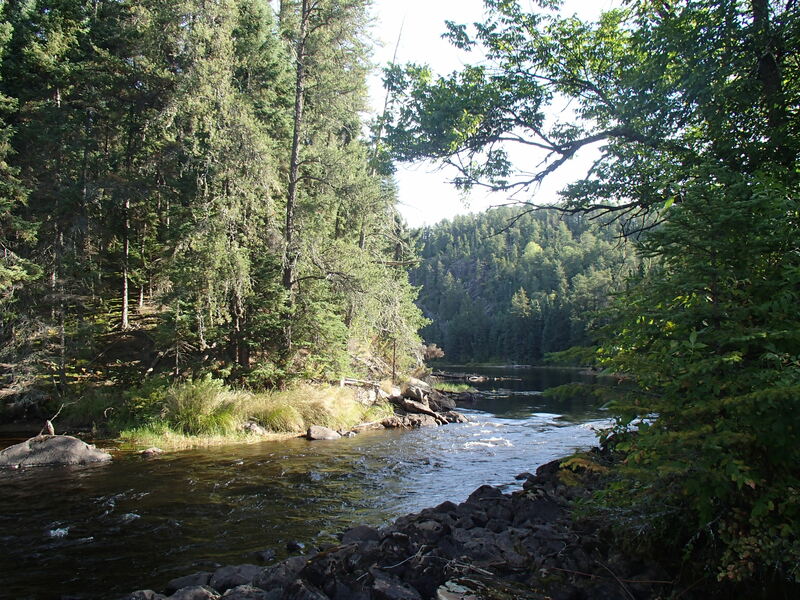 We ate one more lunch on the river, and then started the long carry to the truck. We took a couple of breaks, but all in all it wasn’t as bad as we thought it would be. 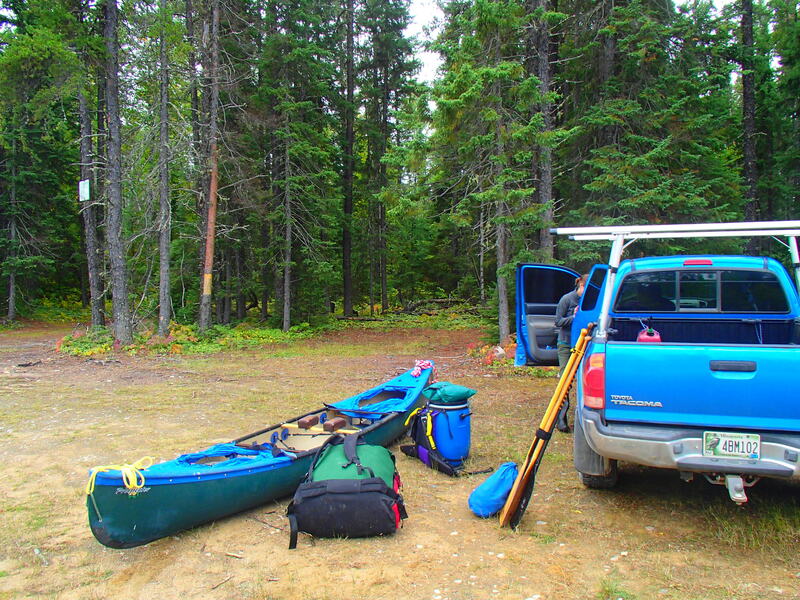 We loaded up and made our way back to Nakina. On the drive we saw our only two moose of the trip. Overall it was a great trip. 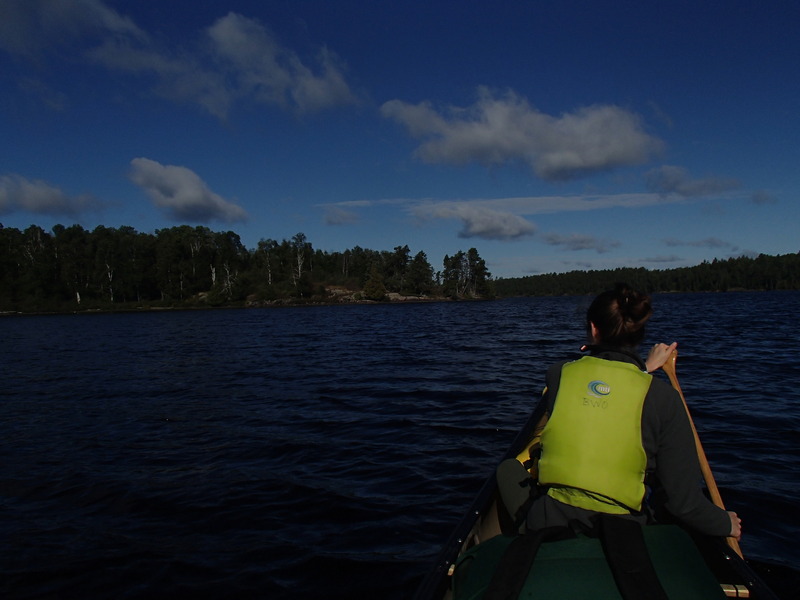 We saw a very varied landscape, and the Kapikotongwa and Little Current where probably the most scenic days of paddling I’ve experienced. 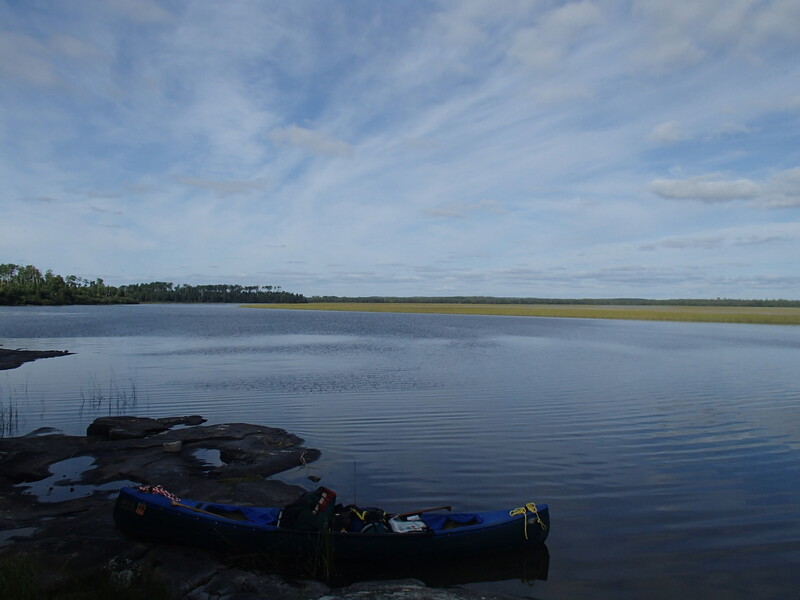 Our last two days where by far the hardest I’ve worked on a canoe trip, but allowed us to see some beautiful remote country without needing a float plane pick up. As a final thought: Would I recommend coming up the Esnagami, and exiting through the logging cut? Probably not. It worked for us, and I’m glad we did it, but even with perfect weather it took almost everything we had. 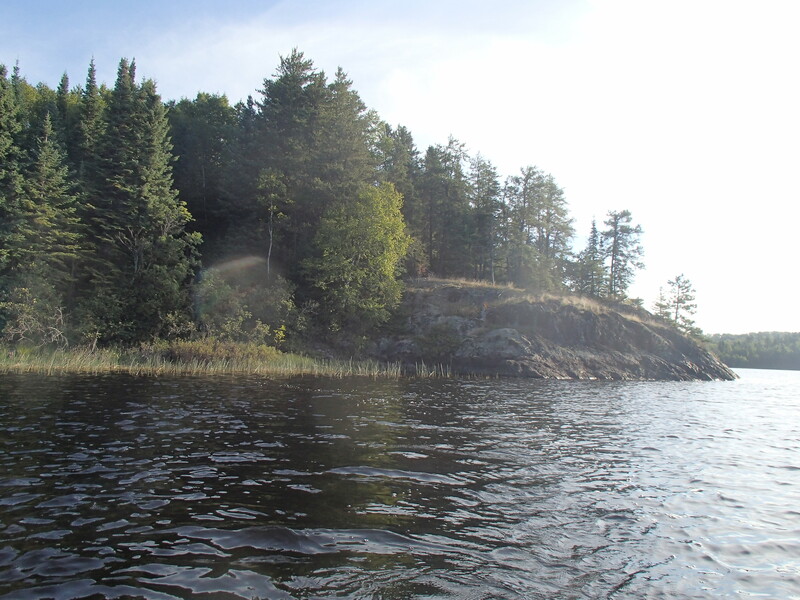 I have, on a few occasions, tried to access Nighthawk lake from the small flowage to the east of the lake. 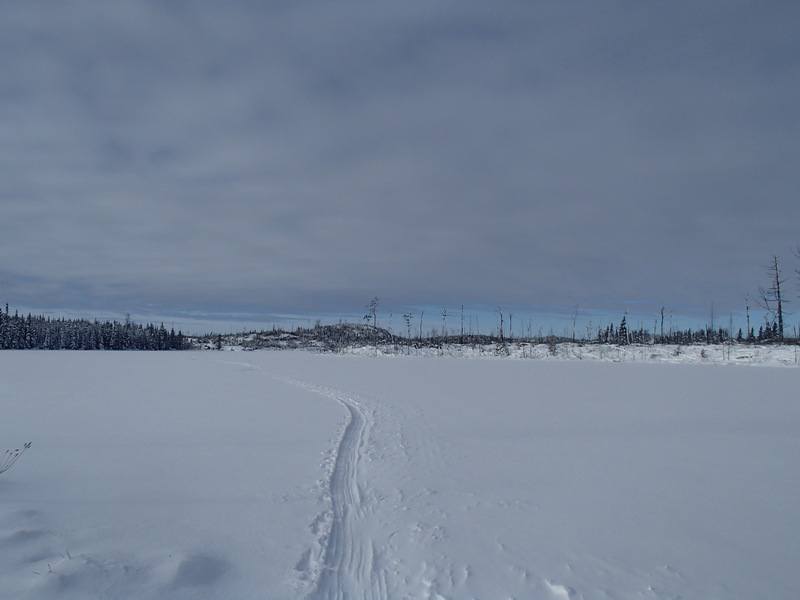 I have always enjoyed overlooking the lake in the winter from the Poplar Creek ski trail. 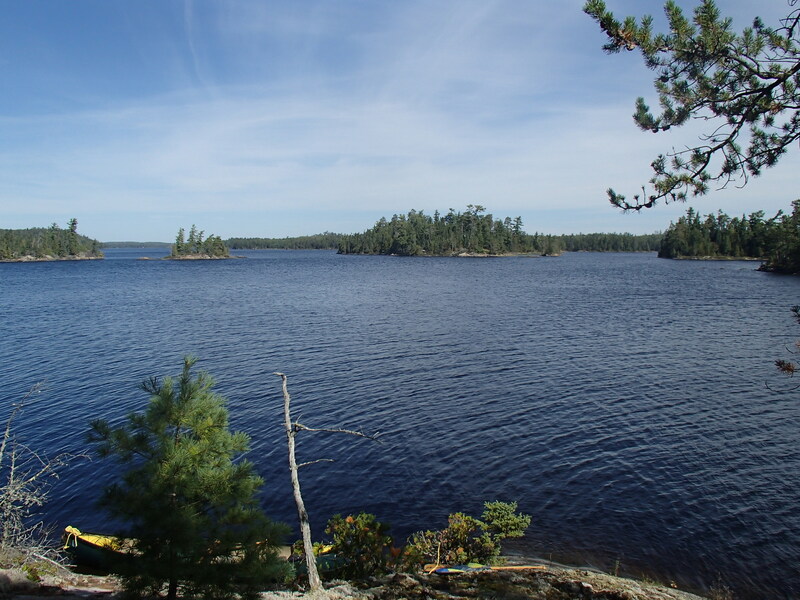 As the planted white pines surrounding the ski trail grow larger it’s possible that in a few years the view of the lake will be diminished, and without a reminder every time I ski or groom by, my curiosity about the lake will wane as well. My previous attempts at getting to Nighthawk have failed due to lack of time, lack of water, or lack of heart. 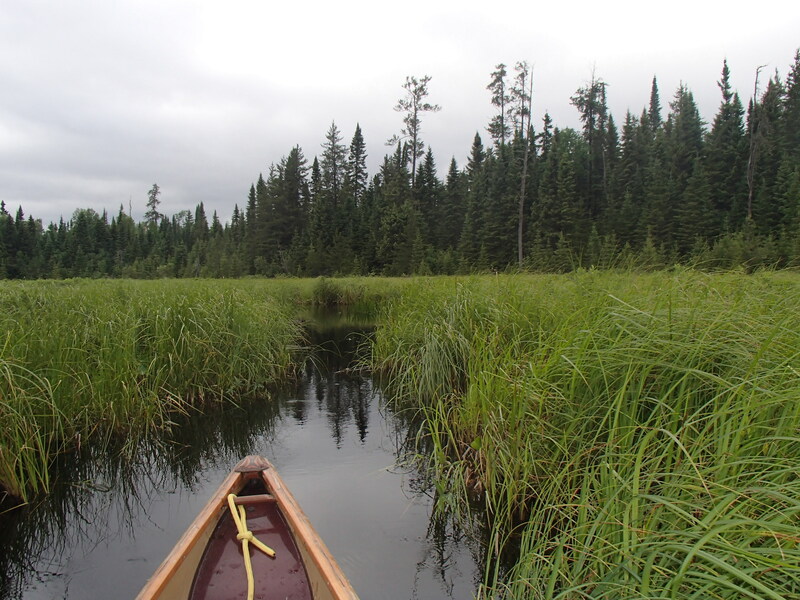 Most of the marsh between the creek and lake sits firmly in the middle ground between land and water, where neither paddling or walking is possible. It is impossible to not become covered in mud, and the bugs are ferocious. This time I gave myself plenty of time. Our water is fairly high. 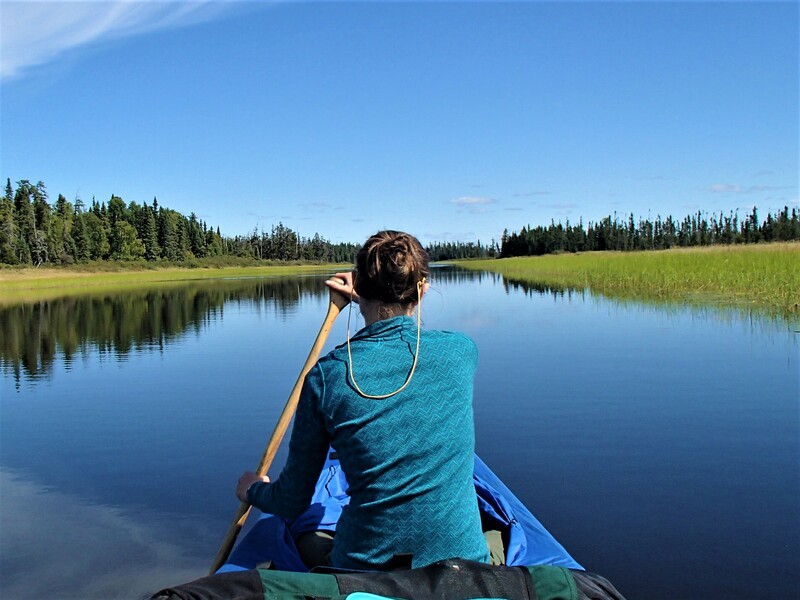 After a few hours of pushing and dragging through through the swamp, I was able to crash through the woods to the small beaver pond down stream of the lake. 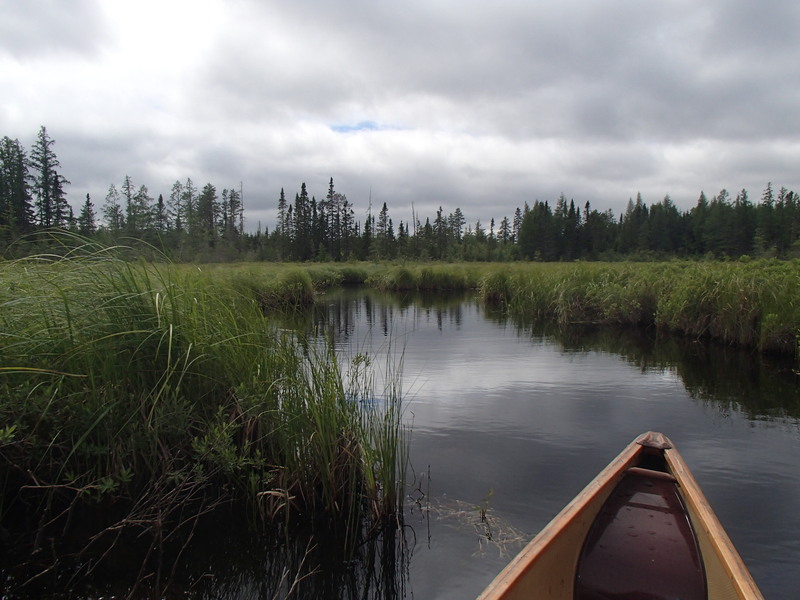 One more climb over a beaver dam, and I had done it! 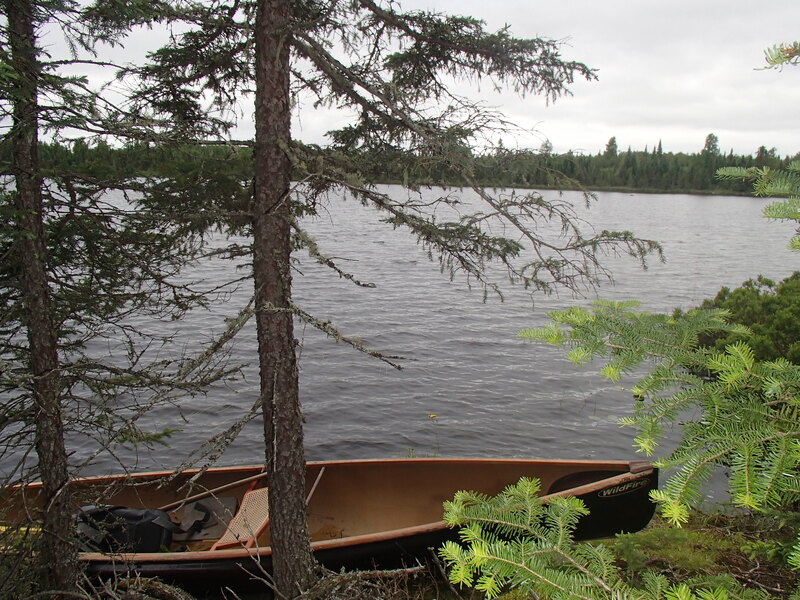 A paddle around Nighthawk revealed it to be a small nondescript lake. 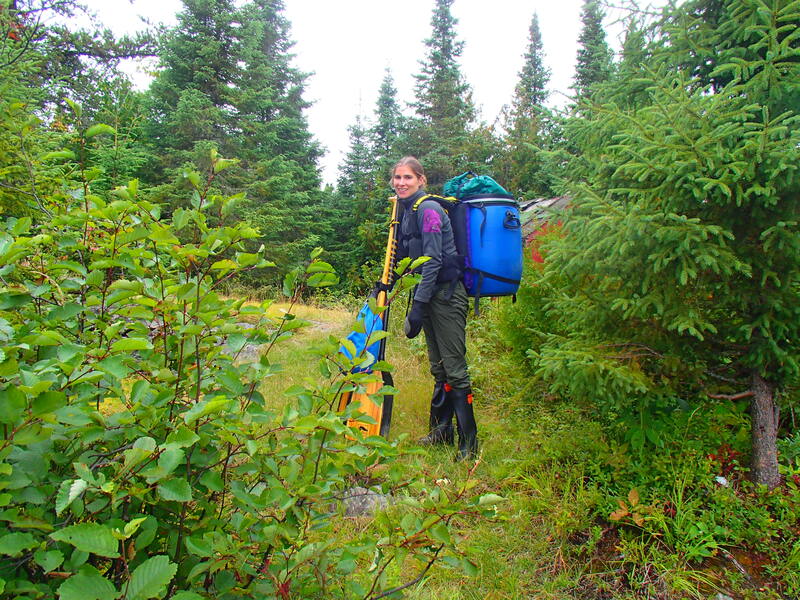 I determined that it would be much easier to simply portage back to my truck on the ski trail. 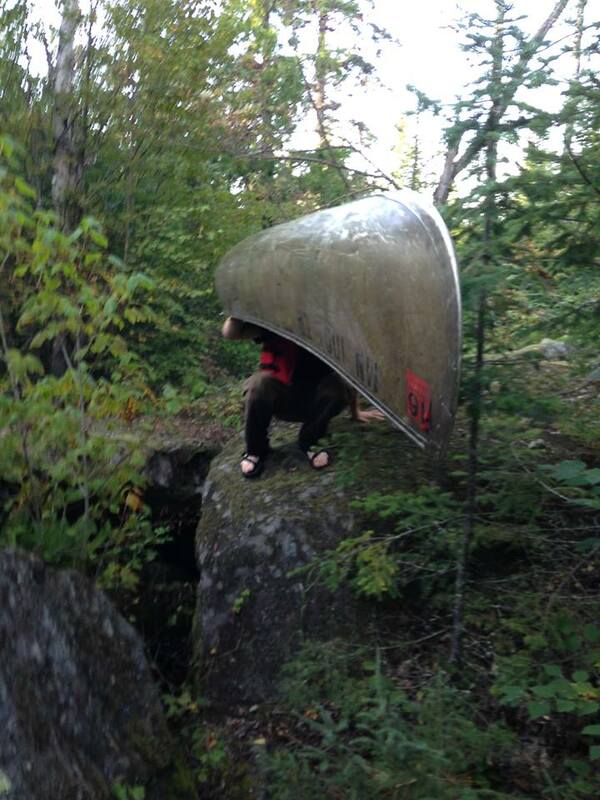 In around twenty minutes I was loading up my canoe. 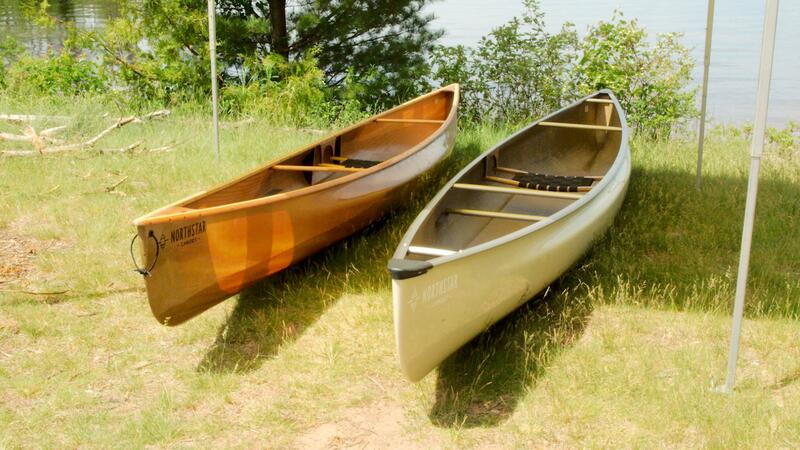 Poplar creek is on the right, Nighthawk the left. The yellow is the “paddling” portion, the orange the walk on the ski trail. At the other side of the Swamp. 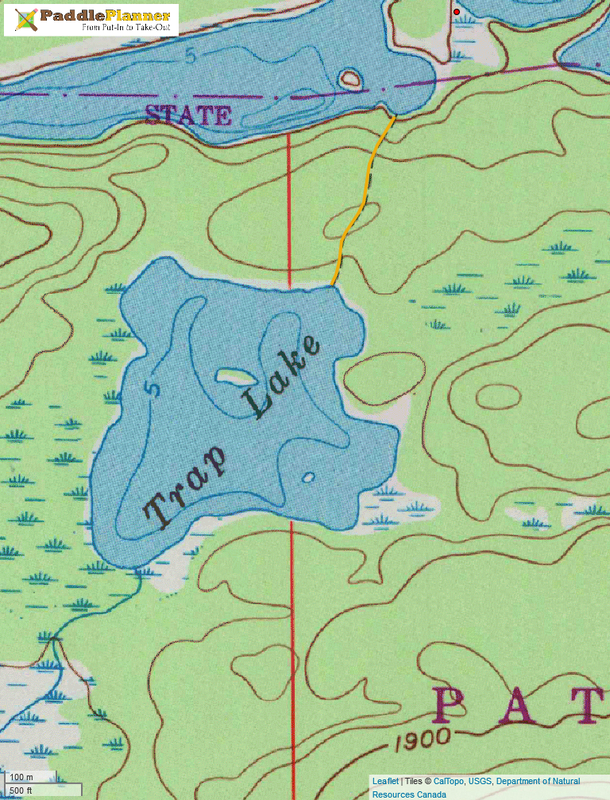 In summary: Is it possible to get to Nighthawk lake from Poplar Creek? Sort off. Should you try it? No. 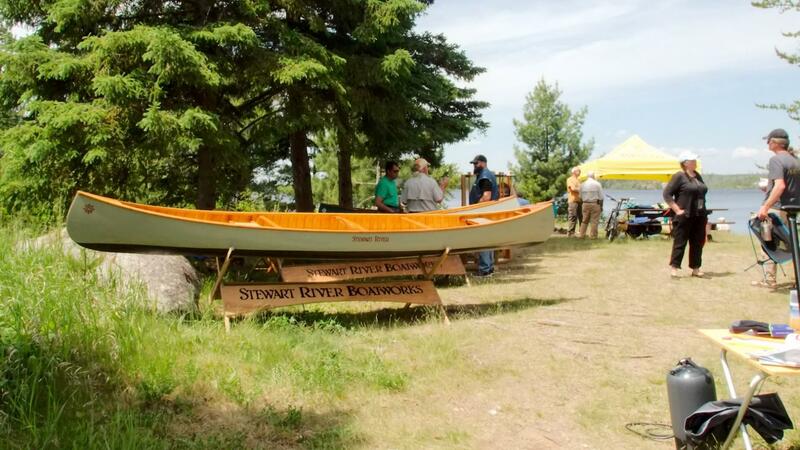 As the planning begins for the 2016 Boundary Waters Expo, I thought I’d give a recap of this year’s inaugural event. 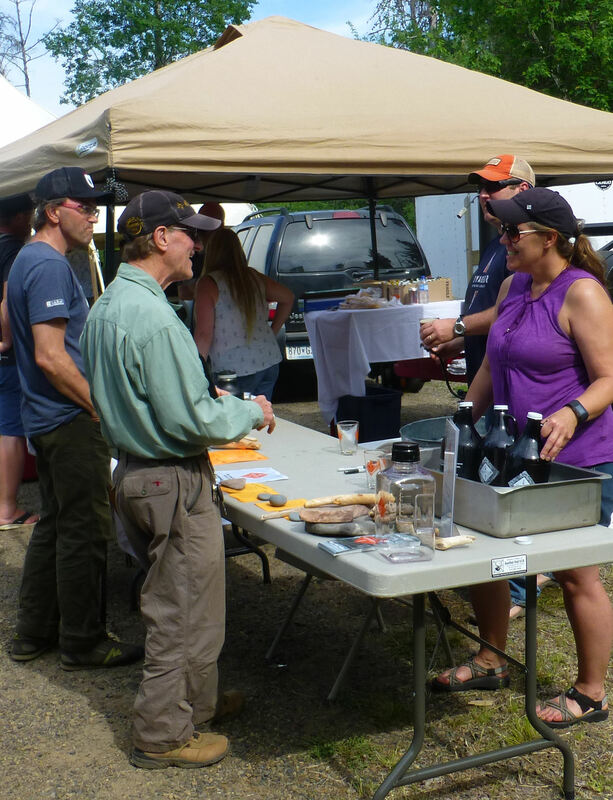 The Boundary Waters Expo was held at the Seagull Public Landing in mid June. 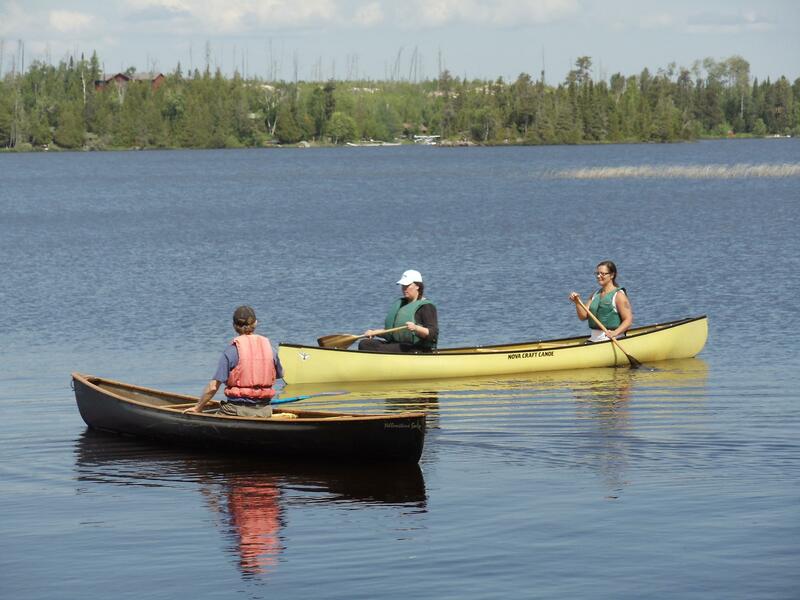 It was highlighted by expert speakers, knowledgeable exhibitors, beautiful canoes, good friends, and perfect weather. We had a nice turnout of around 200-300 people, enough to fill the presentations but not so many that you couldn’t get one-on-one time with the speakers. While the event took a lot of time and effort to get together, in the end I thought it was a great success. 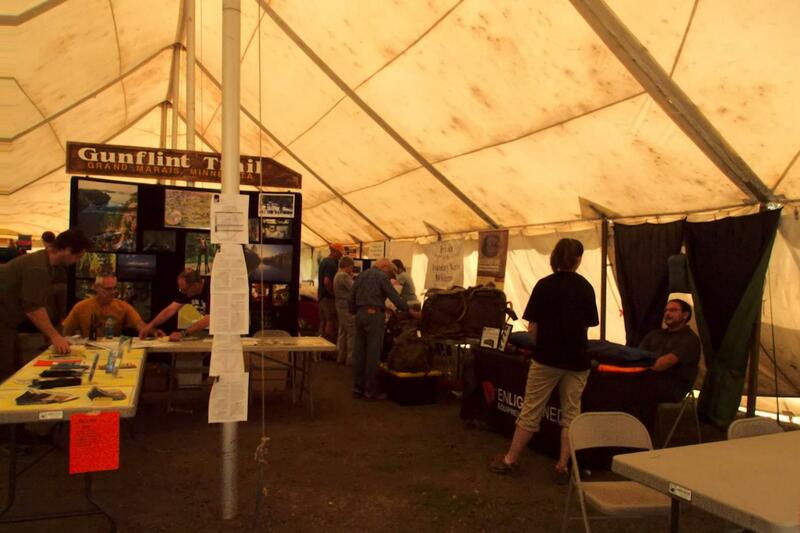 For info on the 2016 show, go to The Boundary Waters Expo or find us on Facebook. 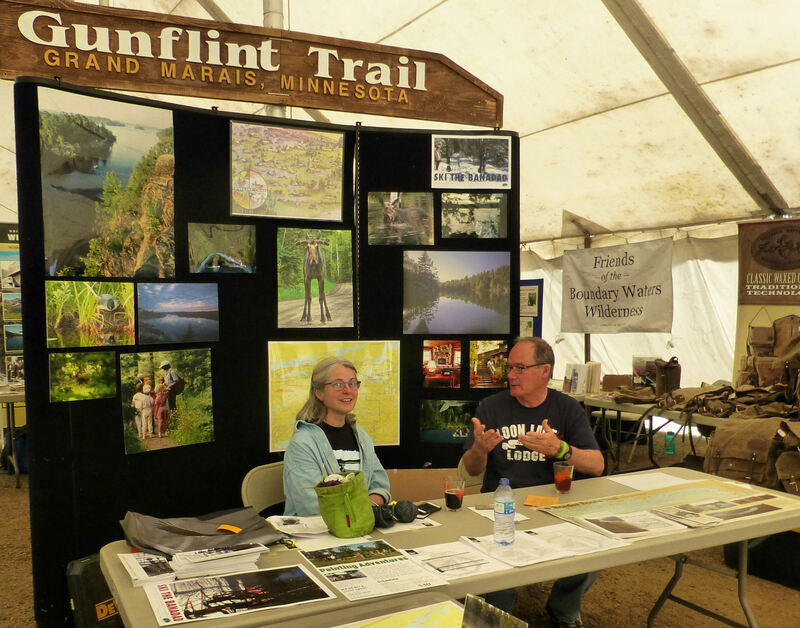 The Gunflint Trail booth was front and center in the big tent. 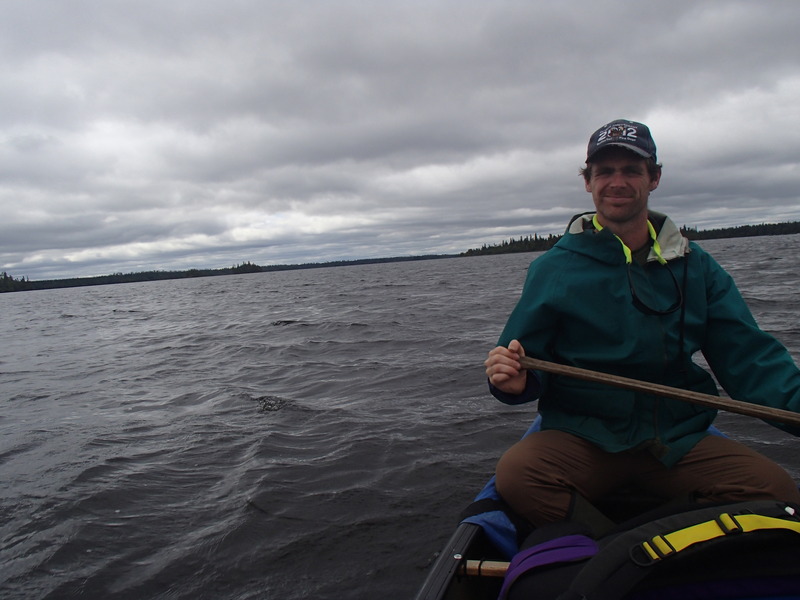 Tom from Loon Lake will talk your ear off! 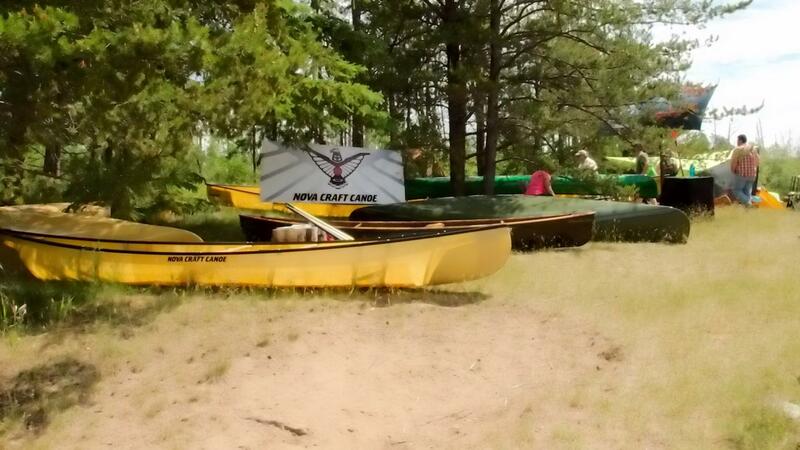 St.Croix Canoes and (not pictured) Souris River. 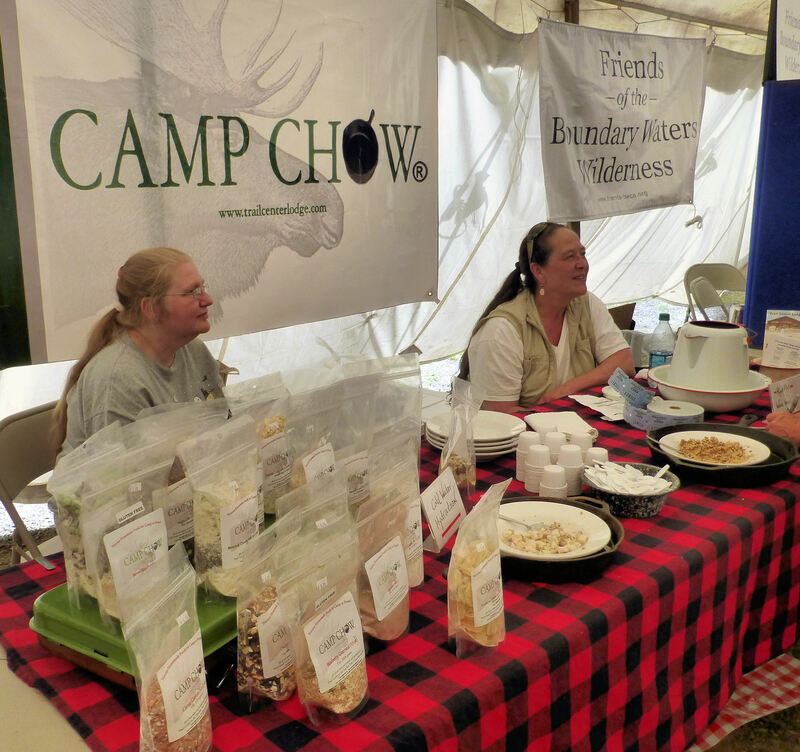 The Gunflint Trail’s own Camp Chow was at the show with their wonderful camping meals. 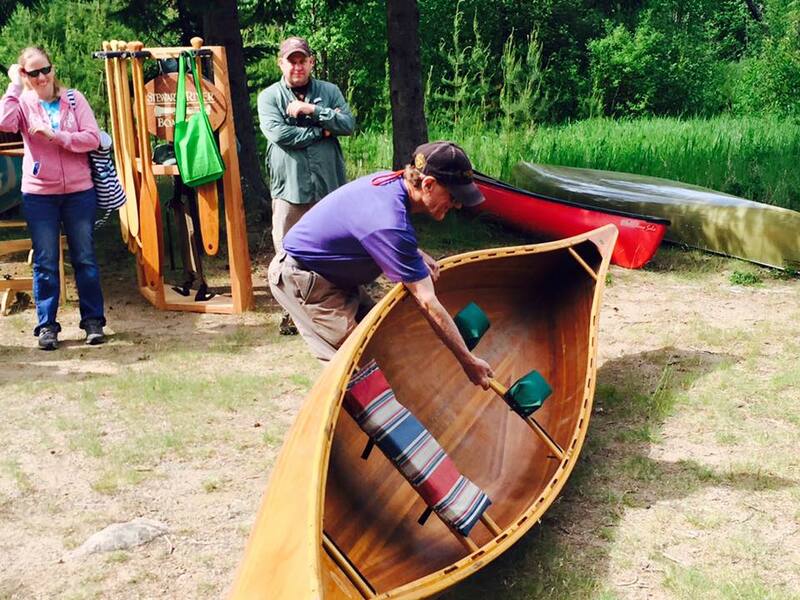 Eric Simula, Bearskin’s musher, presented about building bark canoes. 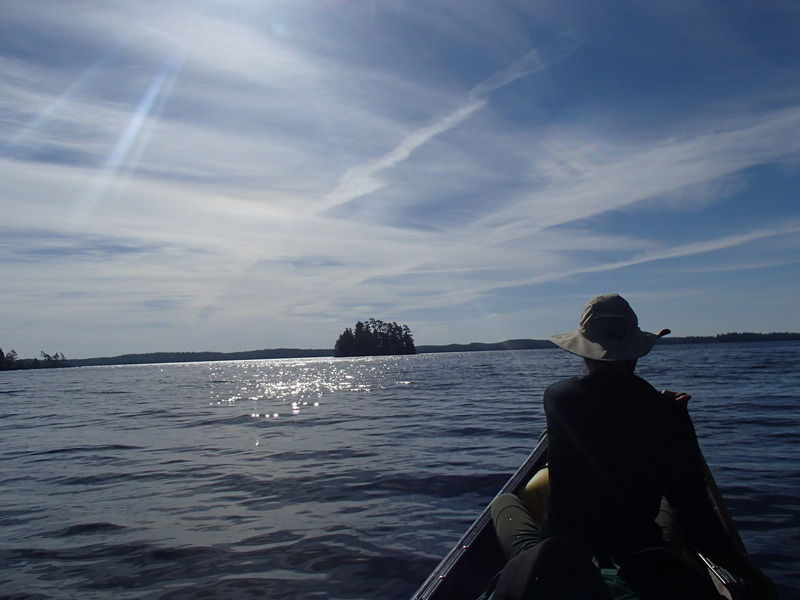 A highlight was personal paddling instruction from canoe legend Cliff Jacobson. Cliff has agreed to be available for lessons throughout the entire expo next year. 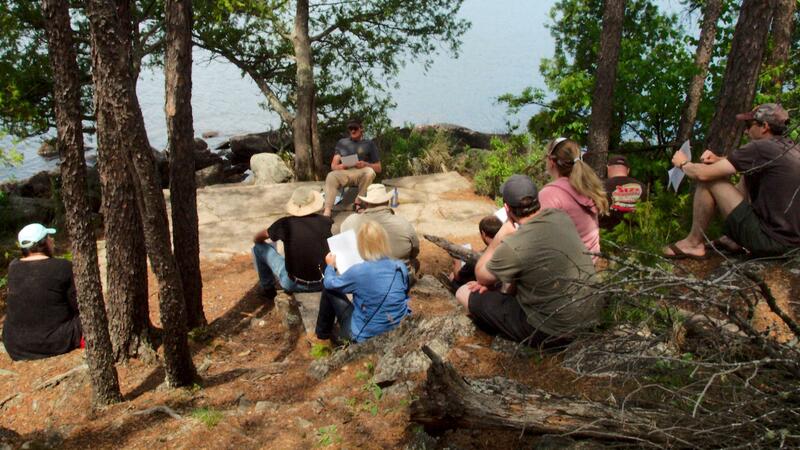 Cliff also demonstrated portaging and gave a few tips. 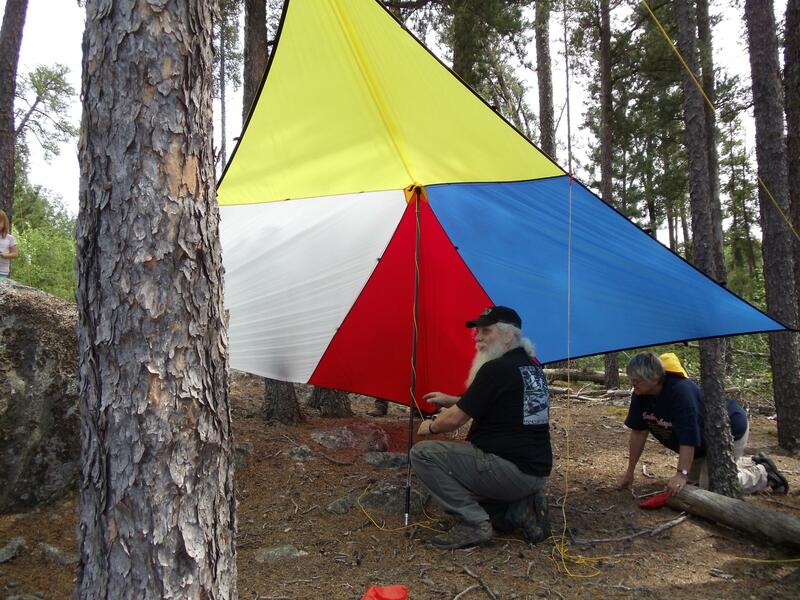 Dan Cooke showed everyone how to rig a tarp. Watch out Dan, someone is sneaking up behind you! The landing was full of great places for speakers to give their presentations. 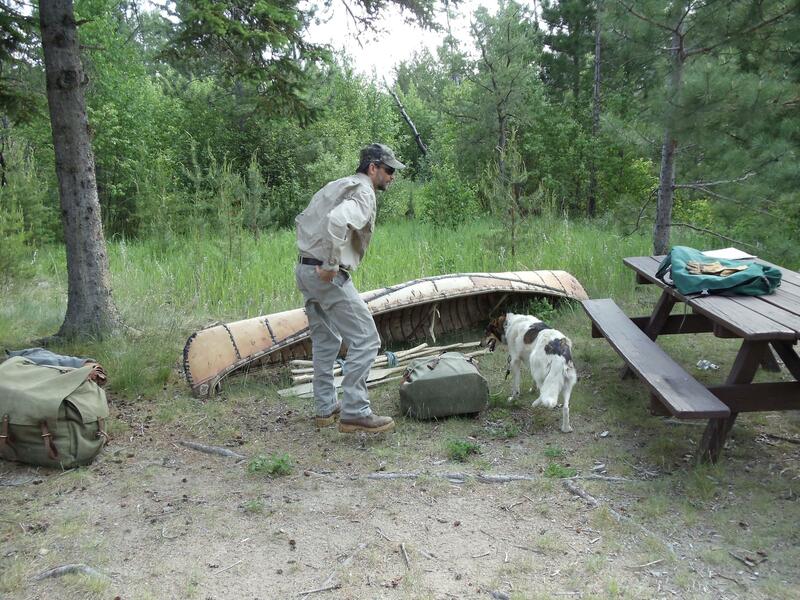 Patti Johnson of the USFS arrived in style in a Forest Service Beaver. The pilot happily gave spectators a tour of his plane.